This register shows 9 generations from James Isaac Creason of Scotland. This page represents the website owner's maternal line. Living descendents are not shown on this page. Help is requested in finding incomplete family links for the Creason line. If you are related to this line, please contact me. 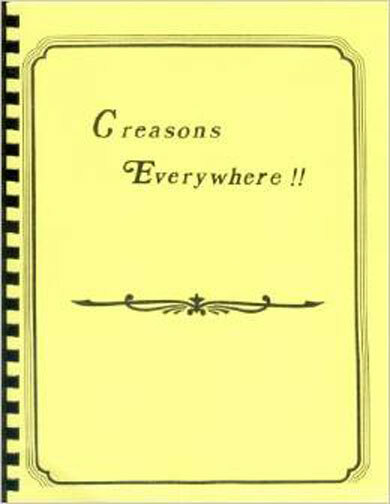 For Creason researchers, the below volumes of the hard-to-find book Creasons Everywhere are now available in PDF format delivered to you by mail on a CD. This book holds an extensive amount of research into many Creason families in the USA and elsewhere. Ms. Dove writes in her forward (Volume 1) that her research began with a search for her great grandfather, Sterling Price Creason. Since these volumes were not widely published, finding them took several years of searching. And because there are many Creason family researchers who would greatly benifit from Ms. Dove's work, I scanned them and I am making it available here. The files contained on this CD are Adobe PDF. You will receive two versions of each volume. The files labelled OCR have been converted to a text searchable format document, so that you may search for names or phrases using Adobe Acrobat. PRICE: $16.00 USD both Volumes 1 AND 2. Plus shipping ($3 for USPS First Class Mail). $12.00 USD for Volume 1 only or Volume 2 only. Plus shipping ($3 for USPS First Class Mail). Payment options available using Paypal, Credit Card, check or cash. Select Which Option and click "Add to Cart"
If shipping was already chosen above, please skip Step #2. If not already selected above, please Select USA or International SHIPPING here and click "Add to Cart"
Shipping cost will be the same for one or more. If ordering 2 or more sets, you may choose separate shipping. If you are related to family line here, you may register for a user account, which will allow you to view all information without censor. James Isaac Creason b. Abt 1760, Scotland. 2. Judith "Judah" Creason b. 1782, Virginia; d. Missouri. 3. Nancy Creason b. 1783. 4. John Creason b. Abt 1785, Fluvana County, Virginia; d. 1870, Scottsville, Sullivan County, Missouri. 5. James Jr Creason b. Abt 1788, or Virginia/Kentucky; d. 26 Jul 1875, Reported in Sacramento Bee and Sacramento Union. Creasons Everywhere Vol 2./Cosumnes Twp, Sacramento County, California; bur. Jul 1875, Union (or Union School) Cemetery. Marker: James Creason d. 7/26/1875 78y Native of Kentucky. With Lois Creason d. 8/23/1871 76y 6m 23d Wife of James Creason. Same plot with Francis A Jenkins, Marinda Oatis, Cebern C Oatis, Francis A Lowe, Charles W Pierce./Sacramento County, California. Judith "Judah" Creason (1.James1) b. 1782, Virginia; d. Missouri. 6. Daniel Moody b. Kentucky. 7. Nancy Moody d. Bef 1848, Missouri. 9. Mary "Polly" Moody b. Abt 1798, Kentucky; d. Bef 1870, Missouri. 10. Jenny "Jane" Moody b. 28 Nov 1800, Kentucky; d. 18 Oct 1879, Santa Clara County, California. 11. John J Moody b. 1803, Kentucky; d. 19 Apr 1882, Mountain View, Santa Clara County, California. 12. James Moody b. Abt 1805, Missouri; d. 1885. 13. Squire B Moody b. 1817, Missouri; d. Bef 1860, Missouri. Nancy Creason (1.James1) b. 1783. John Creason (1.James1) b. Abt 1785, Fluvana County, Virginia; d. 1870, Scottsville, Sullivan County, Missouri. 14. John Creason b. 1809. 15. Leroy "Lindy" Creason b. 16 Nov 1812, St Louis County, Missouri; d. 04 Jan 1864, Sullivan County, Missouri. 16. Hiram Creason b. 1814, , , Missouri, USA. 17. Rachel Creason b. 1815, , , North Carolina, USA. 18. William Riley Creason b. 1819, Missouri or Kentucky. 19. Martha Creason b. 1820. 20. James Francis Creason b. Abt 1821, Missouri; d. Abt 1859, Missouri. 21. Mary Ann Creason b. 1808, St Louis County, Missouri, USA. James Jr Creason (1.James1) b. Abt 1788, or Virginia/Kentucky; d. 26 Jul 1875, Reported in Sacramento Bee and Sacramento Union. Creasons Everywhere Vol 2./Cosumnes Twp, Sacramento County, California; bur. Jul 1875, Union (or Union School) Cemetery. Marker: James Creason d. 7/26/1875 78y Native of Kentucky. With Lois Creason d. 8/23/1871 76y 6m 23d Wife of James Creason. Same plot with Francis A Jenkins, Marinda Oatis, Cebern C Oatis, Francis A Lowe, Charles W Pierce./Sacramento County, California. 22. James Creason b. 1808. 23. Martha "Patsy" Creason b. Abt 1810, Ohio. 24. John Creason b. 26 May 1812, Camden, Lorain County, Ohio; d. 15 Feb 1887, Application, Sons of the American Revolution./Doniphan, Hall County, Nebraska; bur. Feb 1887, Cedarview Cemetery/Doniphan, Hall County, Nebraska. 25. Jane Creason b. 1813, , , Ohio, USA; d. 1862, , , Indiana, USA. 26. Mary Creason b. Dec 1815. Daniel Moody (2.Judith2, 1.James1) b. Kentucky. Nancy Moody (2.Judith2, 1.James1) d. Bef 1848, Missouri. Mary "Polly" Moody (2.Judith2, 1.James1) b. Abt 1798, Kentucky; d. Bef 1870, Missouri. 27. Wilson Haun b. Abt 1817, St. Charles County, Missouri; d. 15 Mar 1893, Delphos, Ottawa County, Kansas. 28. John Haun b. 10 Jan 1818, St. Charles County, Missouri; d. 27 Aug 1849, Missouri. 29. Malinda Haun b. Abt 1820, Missouri; d. 1883, Missouri. 30. Mahala Haun b. May 1822, Missouri; d. Aft 1900, Missouri. 31. Harvey G Haun b. 1825, Missouri. 32. Nancy Jane Haun b. Abt 1828, Missouri; d. 05 Feb 1889, Columbia, Boone County, Missouri. 33. Lydia Ann Haun b. 14 Dec 1830, Missouri; d. 09 Jan 1877, Missouri. 34. Mary Elizabeth Haun b. 23 May 1833, Missouri; d. 21 May 1914, Burnet, Bertram County, Texas. 35. Martha Ann Haun b. 24 May 1833, Missouri; d. 11 Dec 1848, Boone County, Missouri. 36. James Mathias Haun b. Abt 1835, Boone County, Missouri; d. 20 Feb 1900, Green City, Hickory County, Missouri. 37. Sarah Elizabeth Haun b. Abt 1837, Missouri. 38. Melcena Haun b. 08 Feb 1841, Missouri; d. 24 Apr 1926, California Death Index: Melcena E Cowden, Death Date: 24 Apr 1926, Age at Death: 85, Death Place: San Benito, California./San Benito County, California. Jenny "Jane" Moody (2.Judith2, 1.James1) b. 28 Nov 1800, Kentucky; d. 18 Oct 1879, Santa Clara County, California. 39. William M. Haun b. 26 Aug 1819, Missouri; d. 03 Apr 1866, Saratoga, Santa Clara County, California. 40. Zimiriah "Zimry" Haun b. 10 Apr 1822, Jackson County, Missouri; d. Bef 1889, Los Banos, Merced County, California. 41. Mary Ann Haun b. Jun 1824, Missouri. 42. Huldah Haun b. 07 Jul 1826, Warren County, Missouri; d. 19 Jul 1914, Gilroy, Santa Clara County, California. 43. Matilda Haun b. 28 Dec 1828, Missouri; d. 12 Apr 1899, Santa Clara, Santa Clara County, California. 44. Elizabeth Haun b. 11 Apr 1831, Missouri; d. Jan 1912, Watsonville, Santa Cruz County, California. 45. James W Haun b. Abt 1834, Missouri; d. Aft 1910, California. 46. John Moody Haun b. Jan 1840, Missouri; d. 26 Oct 1924, Santa Cruz County, California. 47. Frances Mahala Haun b. Jul 1844, Missouri; d. 02 Jul 1928, Santa Clara County, California. John J Moody (2.Judith2, 1.James1) b. 1803, Kentucky; d. 19 Apr 1882, Mountain View, Santa Clara County, California. 48. Andrew J Moody b. Abt 1823, Missouri; d. Bef 1854, California. 49. George Washington Moody b. 24 Jul 1824, Jackson, Missouri; d. 17 Nov 1909, Laton, Fresno County, California. 50. James F Moody b. Abt 1830, Missouri; d. Bef 1880, Missouri. 51. Mary Jenny Jamina Moody b. Abt 1832, Missouri; d. Mar 1852, Jackson County, Missouri. 52. Barton Stewart Moody b. 19 Dec 1833, Missouri; d. 17 Feb 1914, San Jose, Santa Clara County, California. 53. Daniel Lewis Moody b. 09 Oct 1835, Jackson, Missouri, USA; d. 09 May 1912, San Jose, Santa Clara County, California, USA. 54. Lucy Ann Moody b. 1836, Missouri; d. 1874, Santa Clara, Santa Clara County, California. 55. Nancy Olive Moody b. Mar 1837, Jackson County, Missouri; d. 1904, Oakland, Alameda County, California. 56. Sarah Moody b. 1840, Missouri. 57. Rachel Elizabeth Moody b. 02 May 1844, Jackson County, Missouri; d. 11 Aug 1904, Campbell, Santa Clara County, California. James Moody (2.Judith2, 1.James1) b. Abt 1805, Missouri; d. 1885. 58. Nancy Ann Moody b. 02 Mar 1848, Missouri; d. 02 Jan 1912. 59. Daniel W Moody b. Dec 1849, Missouri. 60. Benjamin "Frank" Franklin Moody b. Abt 1851, Missouri; d. 1935. 61. Julia Anne Moody b. Apr 1854, Missouri; d. 31 Oct 1936, Los Angeles County, California. Squire B Moody (2.Judith2, 1.James1) b. 1817, Missouri; d. Bef 1860, Missouri. 62. Melvina Moody b. Abt 1841, Missouri. 63. Thomas Moody b. Abt 1845, Missouri. 64. Sarah M Moody b. Feb 1845, Missouri; d. 02 Aug 1903, Monument, Grant County, Oregon. 65. Samuel Moody b. Abt 1846, Missouri. 66. Jefferson Moody b. Abt 1849, Missouri. John Creason (4.John2, 1.James1) b. 1809. Leroy "Lindy" Creason (4.John2, 1.James1) b. 16 Nov 1812, St Louis County, Missouri; d. 04 Jan 1864, Sullivan County, Missouri. 67. John R twin Creason b. 22 May 1833, Chariton County, Missouri; d. 13 Mar 1903, Browining, Linn County, Missouri. 68. James C twin Creason b. 22 May 1833, Chariton County, Missouri; d. 13 Mar 1903, Browining, Linn County, Missouri; bur. Mar 1903, Hoover Cemetery/Browning, Linn County, Missouri. 69. Elizabeth Creason b. 1835, Milan, Sullivan County, Missouri; d. 29 Dec 1864, Yolo County, California; bur. Dec 1864, Mary's Chapel Cemetery/Yolo, Yolo County, California. 70. Collison Teeters "C.T." Creason b. 12 Jan 1836, Chariton County, Missouri; d. 28 Oct 1876, Source: Petition for Letters of Administration filed Nov. 27, 1877 from Probate #337 Old Series, Yolo County, California./Yolo County, California; bur. Oct 1876, St Mary's Cemetery/Woodland, Yolo County, California. 71. Andrew Jackson Creason b. Abt 1838, Locust, Linn County, Missouri. 72. Allen G Creason b. 1840, Locust, Linn County, Missouri; d. 27 Feb 1887. 73. Sterling Price Creason b. 09 Sep 1842, Locust, Linn County, Missouri; d. 24 Jan 1897, FHL Film #1293786: Death Certificates 1889-1903 - Tehama County Recorder. S. P. CREASON, died 24 Jan 1897, Tehama County age 54, he was born in Christianson Co., KY, and his occupation was listed as bridge tender./Tehama County, California; bur. Jan 1897, Tehama Cemetery/Tehama, Tehama County, California. 74. Benton Creason b. 1844, Scottsville, Sullivan County, Missouri. 75. Enos Creason b. 17 Feb 1845, Sullivan County, Missouri; d. 16 Dec 1914, California Death Index: Enos Creason, Birth Year: abt 1845, Death Date: 16 Dec 1914, Age at Death: 69, Death Place: Fresno, California./Fresno County, California. 76. Richard Creason b. 1846, Sullivan County, Missouri; d. 13 Mar 1903, Browning, Linn County, Missouri. 77. Rachel Creason b. 1848, Sullivan County, Missouri. 78. Rhoda J "Rhody" Creason b. Jun 1854, Missouri; d. 24 Sep 1938, St Joseph, Buchanan County, Missouri. Hiram Creason (4.John2, 1.James1) b. 1814, , , Missouri, USA. 79. Rachel Jane Creason b. 11 Jul 1834, Tuscumbia, Miller County, Missouri, USA; d. 24 Apr 1910, Meta, Miller County, Missouri, USA. Rachel Creason (4.John2, 1.James1) b. 1815, , , North Carolina, USA. William Riley Creason (4.John2, 1.James1) b. 1819, Missouri or Kentucky. 80. Andrew "Andy" J Creason b. Abt 1852, Missouri. 81. Eliza Creason b. Abt 1853, Missouri. 82. Mary Katherine Creason b. Mar 1855, Ray County, Missouri; d. 25 Sep 1938, La Habra, Orange County, California. Martha Creason (4.John2, 1.James1) b. 1820. James Francis Creason (4.John2, 1.James1) b. Abt 1821, Missouri; d. Abt 1859, Missouri. 83. John W Creason b. 09 Nov 1842, Info: Death Cert. Birth year also may be 1841. Birthplace also possibly Frankfort, Saline County, Missouri ./Chariton County, Missouri; d. 01 Nov 1925, death cert./Sweet Springs, Saline County, Missouri. 84. Leroy Creason b. Abt 1847, Missouri. Mary Ann Creason (4.John2, 1.James1) b. 1808, St Louis County, Missouri, USA. James Creason (5.James2, 1.James1) b. 1808. Martha "Patsy" Creason (5.James2, 1.James1) b. Abt 1810, Ohio. John Creason (5.James2, 1.James1) b. 26 May 1812, Camden, Lorain County, Ohio; d. 15 Feb 1887, Application, Sons of the American Revolution./Doniphan, Hall County, Nebraska; bur. Feb 1887, Cedarview Cemetery/Doniphan, Hall County, Nebraska. 85. William Henry Creason b. 15 Feb 1842, Missouri; d. Apr 1862, Shiloh, Hardin County, Tennessee. 86. Sarah Jane Creason b. 13 Aug 1843, Iowa; d. 25 Apr 1891. 87. Martha Ann Creason b. 25 Sep 1845, Iowa; d. 26 Mar 1926, Nebraska; bur. Mar 1926, Cedarview Cemetery/Doniphan, Hall County, Nebraska. 88. James twin Creason b. 22 Sep 1848, Iowa; d. 04 Nov 1894, Seward, Logan County, Oklahoma. 89. John twin Creason b. 22 Sep 1848, Iowa; d. 14 Mar 1926, Application, Sons of the American Revolution./Doniphan, Hall County, Nebraska; bur. Mar 1926, Cedarview Cemetery/Doniphan, Hall County, Nebraska. 90. Catherine Creason b. 1850, Iowa. 91. Louisa Creason b. 22 Apr 1851. 92. Mariah Bella Creason b. 19 May 1852, Iowa; d. 06 Jun 1926, Hall County, Nebraska. 93. Rhoda E Creason b. 17 May 1855, Iowa. 94. Mary Elizabeth Creason b. 1860. Jane Creason (5.James2, 1.James1) b. 1813, , , Ohio, USA; d. 1862, , , Indiana, USA. Mary Creason (5.James2, 1.James1) b. Dec 1815. Wilson Haun (9.Mary3, 2.Judith2, 1.James1) b. Abt 1817, St. Charles County, Missouri; d. 15 Mar 1893, Delphos, Ottawa County, Kansas. John Haun (9.Mary3, 2.Judith2, 1.James1) b. 10 Jan 1818, St. Charles County, Missouri; d. 27 Aug 1849, Missouri. Malinda Haun (9.Mary3, 2.Judith2, 1.James1) b. Abt 1820, Missouri; d. 1883, Missouri. Mahala Haun (9.Mary3, 2.Judith2, 1.James1) b. May 1822, Missouri; d. Aft 1900, Missouri. Harvey G Haun (9.Mary3, 2.Judith2, 1.James1) b. 1825, Missouri. Nancy Jane Haun (9.Mary3, 2.Judith2, 1.James1) b. Abt 1828, Missouri; d. 05 Feb 1889, Columbia, Boone County, Missouri. Lydia Ann Haun (9.Mary3, 2.Judith2, 1.James1) b. 14 Dec 1830, Missouri; d. 09 Jan 1877, Missouri. Mary Elizabeth Haun (9.Mary3, 2.Judith2, 1.James1) b. 23 May 1833, Missouri; d. 21 May 1914, Burnet, Bertram County, Texas. Martha Ann Haun (9.Mary3, 2.Judith2, 1.James1) b. 24 May 1833, Missouri; d. 11 Dec 1848, Boone County, Missouri. James Mathias Haun (9.Mary3, 2.Judith2, 1.James1) b. Abt 1835, Boone County, Missouri; d. 20 Feb 1900, Green City, Hickory County, Missouri. Sarah Elizabeth Haun (9.Mary3, 2.Judith2, 1.James1) b. Abt 1837, Missouri. Melcena Haun (9.Mary3, 2.Judith2, 1.James1) b. 08 Feb 1841, Missouri; d. 24 Apr 1926, California Death Index: Melcena E Cowden, Death Date: 24 Apr 1926, Age at Death: 85, Death Place: San Benito, California./San Benito County, California. 95. Mary Catherine Cowden b. Abt 1867, California. 96. George W Cowden b. Abt 1873, California. 97. Anna B Cowden b. Abt 1875, California. 98. Charles A Cowden b. Abt 1879, California. William M. Haun (10.Jenny3, 2.Judith2, 1.James1) b. 26 Aug 1819, Missouri; d. 03 Apr 1866, Saratoga, Santa Clara County, California. Zimiriah "Zimry" Haun (10.Jenny3, 2.Judith2, 1.James1) b. 10 Apr 1822, Jackson County, Missouri; d. Bef 1889, Los Banos, Merced County, California. Mary Ann Haun (10.Jenny3, 2.Judith2, 1.James1) b. Jun 1824, Missouri. Huldah Haun (10.Jenny3, 2.Judith2, 1.James1) b. 07 Jul 1826, Warren County, Missouri; d. 19 Jul 1914, Gilroy, Santa Clara County, California. Matilda Haun (10.Jenny3, 2.Judith2, 1.James1) b. 28 Dec 1828, Missouri; d. 12 Apr 1899, Santa Clara, Santa Clara County, California. Elizabeth Haun (10.Jenny3, 2.Judith2, 1.James1) b. 11 Apr 1831, Missouri; d. Jan 1912, Watsonville, Santa Cruz County, California. James W Haun (10.Jenny3, 2.Judith2, 1.James1) b. Abt 1834, Missouri; d. Aft 1910, California. John Moody Haun (10.Jenny3, 2.Judith2, 1.James1) b. Jan 1840, Missouri; d. 26 Oct 1924, Santa Cruz County, California. Frances Mahala Haun (10.Jenny3, 2.Judith2, 1.James1) b. Jul 1844, Missouri; d. 02 Jul 1928, Santa Clara County, California. Andrew J Moody (11.John3, 2.Judith2, 1.James1) b. Abt 1823, Missouri; d. Bef 1854, California. George Washington Moody (11.John3, 2.Judith2, 1.James1) b. 24 Jul 1824, Jackson, Missouri; d. 17 Nov 1909, Laton, Fresno County, California. 99. Thomas Franklin Moody b. 31 May 1855, Santa Clara County, California; d. 16 Jan 1937, Laton, Fresno County, California. James F Moody (11.John3, 2.Judith2, 1.James1) b. Abt 1830, Missouri; d. Bef 1880, Missouri. Mary Jenny Jamina Moody (11.John3, 2.Judith2, 1.James1) b. Abt 1832, Missouri; d. Mar 1852, Jackson County, Missouri. Barton Stewart Moody (11.John3, 2.Judith2, 1.James1) b. 19 Dec 1833, Missouri; d. 17 Feb 1914, San Jose, Santa Clara County, California. Daniel Lewis Moody (11.John3, 2.Judith2, 1.James1) b. 09 Oct 1835, Jackson, Missouri, USA; d. 09 May 1912, San Jose, Santa Clara County, California, USA. Lucy Ann Moody (11.John3, 2.Judith2, 1.James1) b. 1836, Missouri; d. 1874, Santa Clara, Santa Clara County, California. Nancy Olive Moody (11.John3, 2.Judith2, 1.James1) b. Mar 1837, Jackson County, Missouri; d. 1904, Oakland, Alameda County, California. Sarah Moody (11.John3, 2.Judith2, 1.James1) b. 1840, Missouri. Rachel Elizabeth Moody (11.John3, 2.Judith2, 1.James1) b. 02 May 1844, Jackson County, Missouri; d. 11 Aug 1904, Campbell, Santa Clara County, California. Nancy Ann Moody (12.James3, 2.Judith2, 1.James1) b. 02 Mar 1848, Missouri; d. 02 Jan 1912. Daniel W Moody (12.James3, 2.Judith2, 1.James1) b. Dec 1849, Missouri. Benjamin "Frank" Franklin Moody (12.James3, 2.Judith2, 1.James1) b. Abt 1851, Missouri; d. 1935. Julia Anne Moody (12.James3, 2.Judith2, 1.James1) b. Apr 1854, Missouri; d. 31 Oct 1936, Los Angeles County, California. Melvina Moody (13.Squire3, 2.Judith2, 1.James1) b. Abt 1841, Missouri. Thomas Moody (13.Squire3, 2.Judith2, 1.James1) b. Abt 1845, Missouri. Sarah M Moody (13.Squire3, 2.Judith2, 1.James1) b. Feb 1845, Missouri; d. 02 Aug 1903, Monument, Grant County, Oregon. 100. Emmett Cochran b. 06 Feb 1869, Clackamas County, Oregon; d. 18 Feb 1944, Monument, Grant County, Oregon. 101. Annette Cochran b. 1873, Oregon; d. 24 May 1947, Monument, Grant County, Oregon. Samuel Moody (13.Squire3, 2.Judith2, 1.James1) b. Abt 1846, Missouri. Jefferson Moody (13.Squire3, 2.Judith2, 1.James1) b. Abt 1849, Missouri. John R twin Creason (15.Leroy3, 4.John2, 1.James1) b. 22 May 1833, Chariton County, Missouri; d. 13 Mar 1903, Browining, Linn County, Missouri. 102. Pernicia Creason b. Abt 1857, Missouri. 103. Pernelia J Creason b. 1858, Missouri. 104. John Leroy Creason b. Apr 1862, Missouri. 105. Nancy Creason b. Abt 1868, Missouri. 106. Susan Creason b. 1870, Missouri. 107. Marshall Creason b. 1873, Missouri. 108. Floy Creason b. Abt 1873, Missouri. James C twin Creason (15.Leroy3, 4.John2, 1.James1) b. 22 May 1833, Chariton County, Missouri; d. 13 Mar 1903, Browining, Linn County, Missouri; bur. Mar 1903, Hoover Cemetery/Browning, Linn County, Missouri. 109. Robert Andrew Creason b. 13 Mar 1858, Sullivan County, Missouri; d. 11 Apr 1945, Death Certificate: Widowed/Browning, Sullivan County, Missouri; bur. Apr 1945, Hoover Cemetery/Browning, Linn County, Missouri. 110. Willard Edward "Edgar" Creason b. 08 Dec 1859, Sullivan County, Missouri; d. 10 Jan 1933, Browning, Linn County, Missouri. 111. Leroy Franklin "Frank" Creason b. 07 Sep 1863, Browning, Linn County, Missouri; d. 10 Mar 1950, Death certificate/Browning, Linn County, Missouri. 112. Walter Grant Creason b. 20 Sep 1865, Duncan, Sullivan County, Missouri; d. 23 Oct 1893, Missouri. 113. Homer Emmet Creason b. 18 Sep 1871, Missouri; d. 13 Dec 1952, Death certificate: Informant is Lawrence Creason, Browning, Missouri./Browning, Sullivan County, Missouri. Elizabeth Creason (15.Leroy3, 4.John2, 1.James1) b. 1835, Milan, Sullivan County, Missouri; d. 29 Dec 1864, Yolo County, California; bur. Dec 1864, Mary's Chapel Cemetery/Yolo, Yolo County, California. 114. Alonzo Hatcher b. 20 Jan 1854, Sullivan County, Missouri; d. 05 Aug 1940, Yolo County, California. 115. Marselena Hatcher b. Abt 1856, Sullivan County, Missouri. 116. Margaret Ellen Hatcher b. May 1856, Sullivan County, Missouri; d. 03 Oct 1930, California. 117. John William Hatcher b. Abt 1859, Sullivan County, Missouri. 118. Sterling A Hatcher b. 1864, Born shortly before the death of his mother in Dec 1864 (Creasons Everywhere pg72)/California; d. 1865, Died at 9 months (Creasons Everywhere pg 72)./California. Collison Teeters "C.T." Creason (15.Leroy3, 4.John2, 1.James1) b. 12 Jan 1836, Chariton County, Missouri; d. 28 Oct 1876, Source: Petition for Letters of Administration filed Nov. 27, 1877 from Probate #337 Old Series, Yolo County, California./Yolo County, California; bur. Oct 1876, St Mary's Cemetery/Woodland, Yolo County, California. 119. David Creason b. Abt 1862, Missouri; d. Bef 1877, David Creason is not listed in 1877 probate documents for Collison Creason, so it is presumed he was no longer alive./California. 120. Elizabeth Hulda Creason b. 19 Aug 1866, Missouri; d. 25 Jun 1950, California Death Index: Elizabeth Hulda Haines (Creason], Birth: 19 Aug 1866, Missouri, Death: 25 Jun 1950, Los Angeles, Mother's Maiden Name: Jacobs, Father's Surname: Creason./Los Angeles County, California. 121. Hester Martha Creason b. Aug 1869, Missouri; d. Jun 1935, Los Angeles County, California; bur. 24 Jun 1935, The Los Angeles Times Death Notice: SMITH: Hester K Smith. Services today at 2:30 p.m. in the Wee Kirk O' the Heather. Mortuary, Forest Lawn Memorial Park Association, Inc., in charge./Glendale, Los Angeles County, California. 122. Leonard Lee Sr Creason b. 16 Nov 1871, Sullivan County, Missouri; d. 17 Nov 1934, Milan, Sullivan County, Missouri; bur. 18 Nov 1934, Oakwood Cemetery/Milan, Sullivan County, Missouri. 123. John Logan Creason b. Mar 1874, Missouri; d. 13 Sep 1958, St Joseph, Buchanan County, Missouri. 124. Mary Alice Creason b. 12 Feb 1857, Missouri; d. 09 Sep 1932, Shaw Villa Rest Home, Glendale, California (Creasons Everywhere). California Death Index: Alice Nelson, Death Date: 9 Sep 1932, Age: 75. Death Place: Los Angeles, California./Glendale, Los Angeles County, California. 125. Charles Albert Creason b. 04 Oct 1859, Missouri; d. 09 Nov 1925, California Death Index: Charles A Creason, Birth Year: abt 1859, Death: 9 Nov 1925, Age at Death: 66, Death Place: Solano, California/Vallejo, Solano County, California; bur. Nov 1925, Masonic & Odd Fellows Cemetery, 808 Main St, Vallejo, California (Creasons Everywhere)./Vallejo, Solano County, California. 126. Albert Alexander "Alex" Creason b. 27 May 1860, Missouri; d. 04 Feb 1930, California Death Index: Alex Creason, Birth Year: abt 1861, Death Date: 4 Feb 1930, Age at Death: 69, Death Place: Fresno, California./Selma, Fresno County, California; bur. Feb 1930, Kingsburg Cemetery/Kingsburg, Fresno County, California. Andrew Jackson Creason (15.Leroy3, 4.John2, 1.James1) b. Abt 1838, Locust, Linn County, Missouri. Allen G Creason (15.Leroy3, 4.John2, 1.James1) b. 1840, Locust, Linn County, Missouri; d. 27 Feb 1887. 127. George Washington Creason b. 25 Dec 1867, Clay County, Missouri; d. 05 Aug 1917, Dalton, Chariton County, Missouri. 128. Robert Lee Creason b. 27 Jan 1868, Clay County, Missouri; d. 02 May 1934, Aholt, Chariton County, Missouri. 129. John Creason b. 09 Sep 1871, Missouri. 130. Benjamin Oscar Creason b. 10 Mar 1873, Kentucky; d. 26 Aug 1952, South Gate, Los Angeles County, California. 131. Mary Alice Creason b. Abt 1875, Missouri. 132. Ola Creason b. 1879. 133. Laura Todd Creason b. 10 Sep 1879, Chariton County, Missouri; d. 16 Feb 1942, Clay County, Missouri. 134. Emma Creason b. 10 Sep 1879, Missouri. Sterling Price Creason (15.Leroy3, 4.John2, 1.James1) b. 09 Sep 1842, Locust, Linn County, Missouri; d. 24 Jan 1897, FHL Film #1293786: Death Certificates 1889-1903 - Tehama County Recorder. S. P. CREASON, died 24 Jan 1897, Tehama County age 54, he was born in Christianson Co., KY, and his occupation was listed as bridge tender./Tehama County, California; bur. Jan 1897, Tehama Cemetery/Tehama, Tehama County, California. 135. Robert Edward Lee Creason b. 24 Mar 1867, Yolo County, California; d. 28 Aug 1908, Railroad Hospital (Obit)/Sacramento, Sacramento County, California; bur. Aug 1908, Knights Landing Cemetery/Knights Landing, Yolo County, California. 136. Mary "Mayme" Aletha Creason b. 30 Jan 1870, Yolo, Yolo County, California; d. 22 Feb 1955, California Death Index: Mary Aletha Edson, Birth Date: 30 Jan 1870, Birthplace: California, Death Date: 22 Feb 1955, Death Place: Yolo, Mother's Maiden Name: Taylor, Father's Surname: Cruson./Woodland, Yolo County, California; bur. Feb 1955, Knights Landing Cemetery/Knights Landing, Yolo County, California. 137. Elizabeth "Lizzie" Creason b. 19 Sep 1872, Yolo County, California; d. 28 Nov 1890, Never married/; bur. Nov 1890, Knights Landing Cemetery/Knights Landing, Yolo County, California. 138. Lemuel Creason b. Abt 1873, California; d. Bef 1900. 139. Louisa "Lucy" Bush Creason b. 02 May 1875, California; d. 17 Jun 1963, California Death Index: Lucy B Mallett, Birth: 2 May 1875, California, Death: 17 Jun 1963, Riverside, Mother's Maiden Name: Taylor./Riverside, Riverside County, California; bur. Jun 1963, Fairhaven Memorial Park/Orange County, California. 140. James "Mat" Madison Creason b. 20 Mar 1877, California; d. 02 Mar 1960, California Death Index: James M Creason, Birth: 20 Mar 1877, California, Death: 2 Mar 1960, Tehama, Mother's Maiden Name: Taylor/Gerber, Tehama County, California; bur. Mar 1960, Oak Hill Cemetery/Red Bluff, Tehama County, California. 141. Thomas Jefferson "Jeff" Creason b. 30 Jun 1882, Dunnigan, Yolo County, California; d. 31 Jan 1966, Obituary lists wife as Mary. California Death Index: Thomas J Creason, Birth: 30 Jun 1882, California, Death: 31 Jan 1966, Ventura./Oxnard, Ventura County, California; bur. Jan 1966, Rose Hills Memorial Park, Mausoleum of the Valley, Sec 5, Lot D, Grave/Niche 107, Entrance Gate 10. Buried next to wife Mary./Whittier, Los Angeles County, California. 142. Emma F twin Creason b. 02 Jan 1883, California; d. 13 Mar 1964, California Death Index: Emilie F Conley, Birth: 2 Jan 1883, Birth: California. Death: 13 Mar 1964, Fresno Co./Fresno County, California. 143. Eleanor "Ella" F twin Creason b. 02 Jan 1883, California; d. 11 Jan 1959, California Death Index: Eleanor Fred Bradley, Birth: 2 Jan 1883, California. Death: 11 Jan 1959, Placer. Mother's Maiden Name: Taylor. Father's Surname: Creason./Lincoln, Placer County, California; bur. Jan 1959, East Lawn Cemetery/Sacramento, Sacramento County, California. 144. Edward "Ed" Price Creason b. 04 Apr 1885, Yolo County, California; d. 15 Dec 1981, Oregon Death Index: Edward Pri Creason, Age: 96, Birth Date: 3 Apr 1885, Death: 15 Dec 1981, Jackson Co. Spouse: Lillia. Certificate: 81-20333./Ashland, Jackson County, Oregon; bur. Dec 1981, Mountain View Cemetery/Ashland, Jackson County, Oregon. 145. Earl Albert twin Creason b. 26 Jan 1889, California; d. 11 Jun 1973, California Death Index: Earl A Creason, Birth: 26 Jan 1889, California. Death: 11 Jun 1973, Siskiyou Co./Dunsmuir, Siskiyou County, California; bur. Jun 1973, Dunsmuir City Cemetery/Dunsmuir, Siskiyou County, California. 146. Byron Jackson twin Creason b. 26 Jan 1889, California; d. 02 Aug 1909, Tuberculosis./Arizona; bur. Aug 1909, Tehama Cemetery/Tehama, Tehama County, California. Benton Creason (15.Leroy3, 4.John2, 1.James1) b. 1844, Scottsville, Sullivan County, Missouri. Enos Creason (15.Leroy3, 4.John2, 1.James1) b. 17 Feb 1845, Sullivan County, Missouri; d. 16 Dec 1914, California Death Index: Enos Creason, Birth Year: abt 1845, Death Date: 16 Dec 1914, Age at Death: 69, Death Place: Fresno, California./Fresno County, California. 147. Chester C Creason b. 03 Aug 1874, West Grafton, Yolo County, California; d. 31 Oct 1935, Fresno Bee Republican Oct 31, 1935: Found dead on front lawn, apparent heart attack, 844 So. 4th St., Fresno./Fresno, Fresno County, California. 148. Myrtle Creason b. 28 Aug 1876, Birth notice: Sacramento Daily Union, 30 August 1876: "Clarksburg, Yolo county, August 28--Wife of E. Creason, a daughter. "/Clarksburg, Yolo County, California; d. 17 Feb 1932, California Death Index: Myrtle Sloan, Birth Year: abt 1877. Death Date: 17 Feb 1932. Age at Death: 55. Death Place: Santa Barbara, California/Santa Barbara County, California. 149. Linn Lester Creason b. 24 Sep 1878, West Grafton, Yolo County, California; d. 13 Sep 1940, California Death Index: Linn Creason, Birth Date: 24 Sep 1878, Birthplace: California, Death Date: 13 Sep 1940, Death Place: Fresno, Mother's Maiden Name: Taylor, Father's Surname: Creason./Fresno, Fresno County, California. Richard Creason (15.Leroy3, 4.John2, 1.James1) b. 1846, Sullivan County, Missouri; d. 13 Mar 1903, Browning, Linn County, Missouri. Rachel Creason (15.Leroy3, 4.John2, 1.James1) b. 1848, Sullivan County, Missouri. Rhoda J "Rhody" Creason (15.Leroy3, 4.John2, 1.James1) b. Jun 1854, Missouri; d. 24 Sep 1938, St Joseph, Buchanan County, Missouri. 150. Jess Bates b. May 1882, Missouri. 151. Archibald Parish b. 03 Jan 1871, Sullivan County, Missouri; d. 10 Feb 1944, St Joseph Hospital/St Joseph, Buchanan County, Missouri. 152. Ira C "Bud" Parish b. 25 Jun 1873, Milan City, Sullivan County, Missouri; d. 26 Oct 1955, Death Certificate: Died of pneumonia 16 days after receiving 1st and 2nd degree burns. Accident, bedding caught fire./St Joseph, Buchanan County, Missouri. 153. Chester A Parish b. 17 May 1882, Sullivan County, Missouri; d. 02 Nov 1953, Death Certificate lists Chester as a widower./St Joseph, Buchanan County, Missouri. Rachel Jane Creason (16.Hiram3, 4.John2, 1.James1) b. 11 Jul 1834, Tuscumbia, Miller County, Missouri, USA; d. 24 Apr 1910, Meta, Miller County, Missouri, USA. 154. Julyann C Crawford b. 1867, , , Missouri, USA. 155. Robert Roark b. 1852, , Miller, Missouri, USA. 156. Narcissa Roark b. 1854, , Miller, Missouri, USA. 157. Martha J Roark b. 1856, , Miller, Missouri, USA. 158. Mary C Roark b. 1857, , Miller, Missouri, USA. 159. Charles Roark b. 15 Oct 1858, , Miller, Missouri, USA. 160. Julia C Roark b. May 1859, , Miller, Missouri, USA. 161. Boyd Clinton Roark b. 11 Mar 1862, Missouri; d. 11 Sep 1928, Miller County, Missouri. 162. James Thomas Roark b. Jul 1872, , Miller, Missouri, USA; d. Grovis Mills, Creek, Oklahoma, USA. 163. Leanna Roark b. 1875, , Miller, Missouri, USA. 164. Mary Melsema Crane b. 02 Aug 1851, , Miller, Missouri, USA; d. 22 Apr 1922, , Miller, Missouri, USA. 165. Brumley Harrison Crane b. 28 Dec 1851, Miller County, Missouri, USA; d. 19 Feb 1933, Jefferson, Cole County, Missouri. 166. Albert P Crane b. 1856, , , Missouri, USA. 167. Jeremiah "Jerry" M Crane b. 02 Nov 1859, Missouri; d. 16 Mar 1931, Death Certificate/Saline, Miller County, Missouri. Andrew "Andy" J Creason (18.William3, 4.John2, 1.James1) b. Abt 1852, Missouri. Eliza Creason (18.William3, 4.John2, 1.James1) b. Abt 1853, Missouri. Mary Katherine Creason (18.William3, 4.John2, 1.James1) b. Mar 1855, Ray County, Missouri; d. 25 Sep 1938, La Habra, Orange County, California. 168. Lucy Lowe b. Abt 1875, Missouri. 169. Katherine Lowe b. 1875, Missouri. 170. Florence M Lowe b. Abt 1877, Lexington, Lafayette County, Missouri; d. 29 Sep 1955, Fulton County, Georgia. 171. Minnie Bell Lowe b. Apr 1877, Lexington, Lafayette County, Missouri; d. 08 Sep 1947, Lafayette County, Missouri. 172. Gertrude Blanche Lowe b. 04 Feb 1880, Lexington, Lafayette County, Missouri; d. 25 Apr 1926, San Diego County, California. John W Creason (20.James3, 4.John2, 1.James1) b. 09 Nov 1842, Info: Death Cert. Birth year also may be 1841. Birthplace also possibly Frankfort, Saline County, Missouri ./Chariton County, Missouri; d. 01 Nov 1925, death cert./Sweet Springs, Saline County, Missouri. 173. Maude Mae Creason b. Aug 1886, Missouri. 174. Mary Creason b. Sep 1869, Jefferson Township, Saline County, Missouri. 175. Benjamin Franklin "Bud" Creason b. 07 Sep 1877, Missouri; d. 07 Jan 1926, Colorado. 176. Viola E Creason b. 25 May 1879, Sedalia, Pettis County, Missouri; d. 02 Sep 1954, Silvis, Rock Island County, Illinois. Leroy Creason (20.James3, 4.John2, 1.James1) b. Abt 1847, Missouri. William Henry Creason (24.John3, 5.James2, 1.James1) b. 15 Feb 1842, Missouri; d. Apr 1862, Shiloh, Hardin County, Tennessee. Sarah Jane Creason (24.John3, 5.James2, 1.James1) b. 13 Aug 1843, Iowa; d. 25 Apr 1891. 177. Wilbern Burger b. Abt 1866, Nebraska. 178. Minnie M Burger b. Abt 1867, Nebraska. 179. John Edgar Burger b. 29 Jan 1869, Hall County, Nebraska; d. 23 Jan 1939, Council Bluffs, Pottawattamie County, Iowa. 180. Annie Burger b. Abt 1871, Nebraska. 181. Rhonda Burger b. Abt 1873, Nebraska. 182. Bertha Burger b. Abt 1876, Nebraska. 183. Myrtle Ida Burger b. Abt 1878, Nebraska; d. 03 Apr 1932, Long Pine, Brown County, Nebraska. 184. George Eli Burger b. 01 Aug 1880, Doniphan, Hall County, Nebraska; d. 27 Jan 1937, Council Bluffs, Pottawattamie County, Iowa. Martha Ann Creason (24.John3, 5.James2, 1.James1) b. 25 Sep 1845, Iowa; d. 26 Mar 1926, Nebraska; bur. Mar 1926, Cedarview Cemetery/Doniphan, Hall County, Nebraska. 185. Flora A Burger b. Abt 1868, Nebraska. 186. John M H Burger b. Abt 1869. 187. Nettie Burger b. Abt 1877, Nebraska. 188. Albert D Burger b. Abt 1879, Nebraska. James twin Creason (24.John3, 5.James2, 1.James1) b. 22 Sep 1848, Iowa; d. 04 Nov 1894, Seward, Logan County, Oklahoma. 189. Clarence James Creason b. 23 Jun 1880, Nebraska; d. 27 Feb 1962, Colorado. 190. Rhoda Ethel Creason b. Abt 1882, Nebraska. 191. Frederick "Fred" Creason b. Jul 1885, Nebraska. 192. Arthur A Creason b. Apr 1888, Nebraska. John twin Creason (24.John3, 5.James2, 1.James1) b. 22 Sep 1848, Iowa; d. 14 Mar 1926, Application, Sons of the American Revolution./Doniphan, Hall County, Nebraska; bur. Mar 1926, Cedarview Cemetery/Doniphan, Hall County, Nebraska. 193. Della Abigail Creason b. 09 Sep 1870, Doniphan County, Nebraska; d. 16 Mar 1960, Castle Rock, Douglas County, Colorado. 194. Charles Franklin Creason b. 08 Mar 1873, Doniphan, Hall County, Nebraska; d. 24 Dec 1950, Seattle, King County, Washington. 195. Willie Creason b. 24 Nov 1874, Doniphan, Hall County, Nebraska; d. 06 Oct 1875, Doniphan, Hall County, Nebraska. 196. Harvey Edgar Creason b. 06 Aug 1876, Nebraska; d. Jan 1965, Kearney County, Nebraska. 197. Kitty May Creason b. 01 Jun 1878, Nebraska; d. Jan 1973, Glenwood, Mills County, Iowa. 198. Lillie Maud Creason b. 20 Mar 1881, Doniphan, Hall County, Nebraska; d. 25 May 1976, Council Bluffs, Pottawattamie County, Iowa. 199. Fanny A Creason b. Mar 1883, Nebraska; d. 02 Dec 1971, Seattle, King County, Washington. 200. Josephine B "Josie" Creason b. Oct 1884, Doniphan County, Nebraska. 201. Iva Caroline Creason b. 15 Mar 1888, Nebraska; d. 29 Nov 1949, Los Angeles, Los Angeles County, California. 202. Nota M Creason b. Jul 1890, Nebraska. Catherine Creason (24.John3, 5.James2, 1.James1) b. 1850, Iowa. Louisa Creason (24.John3, 5.James2, 1.James1) b. 22 Apr 1851. Mariah Bella Creason (24.John3, 5.James2, 1.James1) b. 19 May 1852, Iowa; d. 06 Jun 1926, Hall County, Nebraska. 203. Lulu May Denman b. 25 Jul 1875, Nebraska. 204. John Hayes Denman b. 07 Nov 1876, Nebraska. 205. Laura Ida Denman b. 21 Jun 1879, Nebraska. 206. Robert Burdette Denman b. 23 Aug 1881, Nebraska. 207. Joseph McKinley Denman b. 17 Dec 1891, Nebraska. Rhoda E Creason (24.John3, 5.James2, 1.James1) b. 17 May 1855, Iowa. Mary Elizabeth Creason (24.John3, 5.James2, 1.James1) b. 1860. Mary Catherine Cowden (38.Melcena4, 9.Mary3, 2.Judith2, 1.James1) b. Abt 1867, California. George W Cowden (38.Melcena4, 9.Mary3, 2.Judith2, 1.James1) b. Abt 1873, California. Anna B Cowden (38.Melcena4, 9.Mary3, 2.Judith2, 1.James1) b. Abt 1875, California. Charles A Cowden (38.Melcena4, 9.Mary3, 2.Judith2, 1.James1) b. Abt 1879, California. Thomas Franklin Moody (49.George4, 11.John3, 2.Judith2, 1.James1) b. 31 May 1855, Santa Clara County, California; d. 16 Jan 1937, Laton, Fresno County, California. 209. Thomas Leroy Moody b. 12 Jan 1888, Laton, Fresno County, California; d. 03 Feb 1973, Hatboro, Montgomery county, Pennsylvania. Emmett Cochran (64.Sarah4, 13.Squire3, 2.Judith2, 1.James1) b. 06 Feb 1869, Clackamas County, Oregon; d. 18 Feb 1944, Monument, Grant County, Oregon. Annette Cochran (64.Sarah4, 13.Squire3, 2.Judith2, 1.James1) b. 1873, Oregon; d. 24 May 1947, Monument, Grant County, Oregon. Pernicia Creason (67.John4, 15.Leroy3, 4.John2, 1.James1) b. Abt 1857, Missouri. Pernelia J Creason (67.John4, 15.Leroy3, 4.John2, 1.James1) b. 1858, Missouri. John Leroy Creason (67.John4, 15.Leroy3, 4.John2, 1.James1) b. Apr 1862, Missouri. Nancy Creason (67.John4, 15.Leroy3, 4.John2, 1.James1) b. Abt 1868, Missouri. Susan Creason (67.John4, 15.Leroy3, 4.John2, 1.James1) b. 1870, Missouri. Marshall Creason (67.John4, 15.Leroy3, 4.John2, 1.James1) b. 1873, Missouri. Floy Creason (67.John4, 15.Leroy3, 4.John2, 1.James1) b. Abt 1873, Missouri. Robert Andrew Creason (68.James4, 15.Leroy3, 4.John2, 1.James1) b. 13 Mar 1858, Sullivan County, Missouri; d. 11 Apr 1945, Death Certificate: Widowed/Browning, Sullivan County, Missouri; bur. Apr 1945, Hoover Cemetery/Browning, Linn County, Missouri. 210. Charlie Creason b. 1880, Sullivan County, Missouri; d. 07 Sep 1880, Sullivan County, Missouri; bur. Sep 1880, Hoover Cemetery. CREASON, Charlie, – 7 Sep 1880, Son of R.A. & E.P. Creason. http://sullivan.mogenweb.org/cemeteries/Hoover_Cemetery.html/Browning, Sullivan County, Missouri. 211. James E Creason b. 06 Sep 1881, Missouri; d. 10 Mar 1958; bur. Mar 1958, Locust Valley Cemetery/Sullivan County, Missouri. 212. Eva Lena Creason b. 09 Dec 1882, Missouri; d. 28 Feb 1959, Browning, Linn County, Missouri; bur. Feb 1959, Locust Valley Cemetery/Sullivan County, Missouri. 213. William Frank Creason b. 09 Oct 1884, Missouri; d. 04 Nov 1963, Milan, Sullivan County, Missouri; bur. Nov 1963, Hoover Cemetery/Browning, Sullivan County, Missouri. 214. Beverly Dickenson Creason b. 10 Feb 1886, Sullivan County, Missouri; d. 08 Feb 1956, Browning, Linn County, Missouri. 215. Malissa "Lissie" Mae Creason b. 06 Mar 1889, Missouri; d. 04 Nov 1918, Died of influenza./Brookfield, Linn County, Missouri. 216. Frances Creason b. Jun 1891, Missouri. 217. Belva A Creason b. Aug 1892, Missouri. 218. Pearl Creason b. Apr 1894, Missouri; d. 1977, Missouri; bur. 1977, Hoover Cemetery/Browning, Sullivan County, Missouri. 219. Veda Rachel Creason b. May 1896, Missouri. 220. Grace A Creason b. 12 Aug 1898, Missouri; d. 05 Nov 1918, Died of influenza./Duncan, Sullivan County, Missouri. 221. Ralph Creason b. Abt 1901, Missouri. Willard Edward "Edgar" Creason (68.James4, 15.Leroy3, 4.John2, 1.James1) b. 08 Dec 1859, Sullivan County, Missouri; d. 10 Jan 1933, Browning, Linn County, Missouri. Leroy Franklin "Frank" Creason (68.James4, 15.Leroy3, 4.John2, 1.James1) b. 07 Sep 1863, Browning, Linn County, Missouri; d. 10 Mar 1950, Death certificate/Browning, Linn County, Missouri. 222. Sylvia Creason b. 08 Feb 1887, Missouri; d. 02 Dec 1889, Missouri. 223. Alva Creason b. 1889, Missouri; d. 05 Mar 1890, Missouri; bur. Mar 1890, Hoover Cemetery. CREASON, Alva, 1889 – 5 Mar 1890, Son of L.F.& N.E. Creason. http://sullivan.mogenweb.org/cemeteries/Hoover_Cemetery.html/Browning, Sullivan County, Missouri. 224. Ola F Creason b. 28 Apr 1891, Scottsville, Sullivan County, Missouri; d. 02 May 1965, Purdin, Linn County, Missouri. 225. Bula M Creason b. Abt 1902, Missouri. Walter Grant Creason (68.James4, 15.Leroy3, 4.John2, 1.James1) b. 20 Sep 1865, Duncan, Sullivan County, Missouri; d. 23 Oct 1893, Missouri. 226. Allie Creason b. 18 Aug 1889, Sullivan County, Missouri; d. 18 Mar 1930, Brookfield, Linn County, Missouri. 227. Iva Creason b. Abt 1891, Missouri. 228. Walter "Roy" LeRoy Creason b. 19 Mar 1893, Browning, Linn County, Missouri; d. 08 Jun 1963, Obituary/Meadville, Linn County, Missouri. Homer Emmet Creason (68.James4, 15.Leroy3, 4.John2, 1.James1) b. 18 Sep 1871, Missouri; d. 13 Dec 1952, Death certificate: Informant is Lawrence Creason, Browning, Missouri./Browning, Sullivan County, Missouri. 229. Bozela Creason b. Feb 1894, Missouri. 230. Elma Ethel Creason b. Feb 1896, Missouri. 231. Arley Creason b. 06 Jun 1898, Sullivan County, Missouri; d. 17 Dec 1899, Sullivan County, Missouri; bur. Dec 1899, Hoover Cemetery. CREASON, Arley, 6 Jun 1898 – 17 Dec1899. Child of H.E. & Maggie Creason. http://sullivan.mogenweb.org/cemeteries/Hoover_Cemetery.html/Browning, Sullivan County, Missouri. 232. George Lawrence Creason b. Abt 1901, Missouri. Alonzo Hatcher (69.Elizabeth4, 15.Leroy3, 4.John2, 1.James1) b. 20 Jan 1854, Sullivan County, Missouri; d. 05 Aug 1940, Yolo County, California. Marselena Hatcher (69.Elizabeth4, 15.Leroy3, 4.John2, 1.James1) b. Abt 1856, Sullivan County, Missouri. Margaret Ellen Hatcher (69.Elizabeth4, 15.Leroy3, 4.John2, 1.James1) b. May 1856, Sullivan County, Missouri; d. 03 Oct 1930, California. 234. William R Hatcher b. Dec 1875, California. 235. Grace E Hatcher b. Jan 1878, California. 236. Hanna E Hatcher b. Aug 1884, California. John William Hatcher (69.Elizabeth4, 15.Leroy3, 4.John2, 1.James1) b. Abt 1859, Sullivan County, Missouri. Sterling A Hatcher (69.Elizabeth4, 15.Leroy3, 4.John2, 1.James1) b. 1864, Born shortly before the death of his mother in Dec 1864 (Creasons Everywhere pg72)/California; d. 1865, Died at 9 months (Creasons Everywhere pg 72)./California. David Creason (70.Collison4, 15.Leroy3, 4.John2, 1.James1) b. Abt 1862, Missouri; d. Bef 1877, David Creason is not listed in 1877 probate documents for Collison Creason, so it is presumed he was no longer alive./California. Elizabeth Hulda Creason (70.Collison4, 15.Leroy3, 4.John2, 1.James1) b. 19 Aug 1866, Missouri; d. 25 Jun 1950, California Death Index: Elizabeth Hulda Haines (Creason], Birth: 19 Aug 1866, Missouri, Death: 25 Jun 1950, Los Angeles, Mother's Maiden Name: Jacobs, Father's Surname: Creason./Los Angeles County, California. Hester Martha Creason (70.Collison4, 15.Leroy3, 4.John2, 1.James1) b. Aug 1869, Missouri; d. Jun 1935, Los Angeles County, California; bur. 24 Jun 1935, The Los Angeles Times Death Notice: SMITH: Hester K Smith. Services today at 2:30 p.m. in the Wee Kirk O' the Heather. Mortuary, Forest Lawn Memorial Park Association, Inc., in charge./Glendale, Los Angeles County, California. 237. Mary Ruby Smith b. Jun 1887, Missouri. 238. Eunice Georgia Smith b. 18 Jan 1891, Milan, Sullivan County, Missouri; d. 24 Jan 1959, Calif Death Index: Eunice Raley, Birth: 18 Jan 1891, Missouri, Death: 24 Jan 1959, Sacramento County. Mother's Maiden Name: Creason, Father's Surname: Smith./Sacramento County, California. 239. Jean Creason Smith b. 18 Nov 1900, Missouri; d. 28 Jun 1960, California Death Index: Jean C Smith, Birth: 18 Nov 1901, Missouri, Death: 28 Jun 1960, Los Angeles, Mother's Maiden Name: Creason./Los Angeles County, California. 240. Alice M Smith b. Abt 1904, Missouri. Leonard Lee Sr Creason (70.Collison4, 15.Leroy3, 4.John2, 1.James1) b. 16 Nov 1871, Sullivan County, Missouri; d. 17 Nov 1934, Milan, Sullivan County, Missouri; bur. 18 Nov 1934, Oakwood Cemetery/Milan, Sullivan County, Missouri. 241. Hazel Creason b. 10 Jun 1898, Milan, Sullivan County, Missouri; d. 17 Oct 1911, Death Certificate: Perforation of bowel from typhoid fever./Milan, Sullivan County, Missouri; bur. 18 Oct 1911, Death Certificate/Oakwood Cemetery, Milan, Sullivan County, Missouri. 242. Gerald Creason b. 05 Feb 1900, Milan, Sullivan County, Missouri; d. 18 Sep 1918, Death Certificate: Pulmonary tuberculosis./Milan, Sullivan County, Missouri; bur. 19 Sep 1918, Death Certificate/Oakwood Cemetery, Milan, Sullivan County, Missouri. 243. Leonard Lee "Hoot" Creason, Jr. b. 19 Aug 1904, Sullivan County, Missouri; d. 23 Feb 1944, California Death Index: Leonard Lee Creason, SSN: 562036564, Birth Date: 19 Aug 1904, Birthplace: Missouri, Death Date: 23 Feb 1944, Death Place: San Diego, Mother's Maiden Name: Parrish, Father's Surname: Creason./San Diego County, California. 244. Kenneth Carroll Creason b. 02 Jun 1908, Milan, Sullivan County, Missouri; d. 02 Aug 2003, Tustin, Orange County, California; bur. Aug 2003, Rose Hills Memorial Park, Garden of Reflection Lawn, Sec 17 Lot 380. Grave/Niche 4. Entrance Gate 1./Whittier, Los Angeles County, California. John Logan Creason (70.Collison4, 15.Leroy3, 4.John2, 1.James1) b. Mar 1874, Missouri; d. 13 Sep 1958, St Joseph, Buchanan County, Missouri. 245. John Logan Jr Creason b. 04 Jul 1912, Milan, Sullivan County, Missouri; d. 24 Aug 1912, Died as infant. Death certificate cited "Not fed intelligently. "/Milan, Sullivan County, Missouri. Mary Alice Creason (70.Collison4, 15.Leroy3, 4.John2, 1.James1) b. 12 Feb 1857, Missouri; d. 09 Sep 1932, Shaw Villa Rest Home, Glendale, California (Creasons Everywhere). California Death Index: Alice Nelson, Death Date: 9 Sep 1932, Age: 75. Death Place: Los Angeles, California./Glendale, Los Angeles County, California. 246. Frank Proctor Nelson b. 15 Aug 1878, California; d. 16 Dec 1950, Los Angeles County, California. 247. Aimee Nelson b. 08 Jun 1883, California; d. 08 Feb 1944, Los Angeles County, California. Charles Albert Creason (70.Collison4, 15.Leroy3, 4.John2, 1.James1) b. 04 Oct 1859, Missouri; d. 09 Nov 1925, California Death Index: Charles A Creason, Birth Year: abt 1859, Death: 9 Nov 1925, Age at Death: 66, Death Place: Solano, California/Vallejo, Solano County, California; bur. Nov 1925, Masonic & Odd Fellows Cemetery, 808 Main St, Vallejo, California (Creasons Everywhere)./Vallejo, Solano County, California. 248. Frances Creason b. 23 Apr 1891, California; d. 14 Mar 1942, California Death Index: Frances C Greene, Birth: 23 Apr 1891, California. Death: 14 Mar 1942, San Francisco. Mother's Maiden Name: Scott, Father's Surname: Creason./San Francisco County, California. 249. Thomas Creason b. Abt 1892, California. Albert Alexander "Alex" Creason (70.Collison4, 15.Leroy3, 4.John2, 1.James1) b. 27 May 1860, Missouri; d. 04 Feb 1930, California Death Index: Alex Creason, Birth Year: abt 1861, Death Date: 4 Feb 1930, Age at Death: 69, Death Place: Fresno, California./Selma, Fresno County, California; bur. Feb 1930, Kingsburg Cemetery/Kingsburg, Fresno County, California. 250. Jessie W Creason b. Apr 1893, California; d. 1924, California Death Index: Jessie Rouch, Death: 11 Jan 1924, Age at Death: 30, Death Place: Fresno, California/Kingsburg, Fresno County, California. 251. Lester Alexander Creason b. 31 Mar 1895, Sacramento County, California; d. 01 Aug 1965, California Death Index: Lester A Creason, Birth: 31 Mar 1895, California, Death: 1 Aug 1965, Contra Costa County, Mother's Maiden Name: Pyllman./Antioch, Contra Costa County, California; bur. Aug 1965, Memory Gardens Cemetery/Concord, Contra Costa County, California. 252. Byron Albert Creason b. 16 Apr 1896, Fresno County, California; d. 10 Apr 1931, California Death Index: Byron Creason, Death: 10 Apr 1931, Age at Death: 34, Death Place: Fresno, California./Fresno County, California; bur. Apr 1931, Kingsburg Cemetery/Kingsburg, Fresno County, California. 253. Albert Creason b. 28 Feb 1898, Fresno County, California; d. 30 May 1899, Fresno County, California; bur. May 1899, Kingsburg Cemetery/Kingsburg, Fresno County, California. 254. Charlotte "Lottie" Marie Creason b. 18 Feb 1901, Charlotte Marie Creason, Birth: 18 Feb 1901, Fresno, California. Father's Name: Alexander Creason, Mother's name: Ida May Pylman./Fresno County, California; d. 13 May 1968, Died in car accident per granddaughter. California Death Index: Lottie M Phillips, Birth: 18 Feb 1901, California. Death: 13 May 1968, Tulare. Mother's Maiden Name: Palman./Tulare County, California. George Washington Creason (72.Allen4, 15.Leroy3, 4.John2, 1.James1) b. 25 Dec 1867, Clay County, Missouri; d. 05 Aug 1917, Dalton, Chariton County, Missouri. 255. Homer E Creason b. 1901, Missouri. 256. Nylene Arvelee Creason b. 16 Sep 1901, Missouri; d. 01 Aug 1981, California Death Index: Nylene Arvelee Villasenor, Birth: 16 Sep 1901, Missouri. Death: 1 Aug 1981, Orange Co. Mother's Maiden Name: Sheppard. Father's Surname: Creason./Orange County, California. 257. Virgil C Creason b. 11 Apr 1904, Missouri; d. 22 Nov 1972, San Diego County, California. Robert Lee Creason (72.Allen4, 15.Leroy3, 4.John2, 1.James1) b. 27 Jan 1868, Clay County, Missouri; d. 02 May 1934, Aholt, Chariton County, Missouri. 258. Floy Creason b. Feb 1899, Missouri. 259. Robert J Creason b. Abt 1901, Missouri. 260. Herbert Creason b. Abt 1904, Missouri. 261. Kelley Creason b. Abt 1906, Missouri. 262. Bethel Creason b. 13 Jul 1907, Missouri; d. 31 Aug 1993, SSDI: Bethel D. Kuhn, SSN: 499-24-8336, Last Residence: 65254 Glasgow, Howard, Missouri. BORN: 13 Jul 1907, Died: 31 Aug 1993/Glasgow, Howard County, Missouri. 263. Hester Creason b. Abt 1912, Missouri. 264. Sylvia Gale "Ben" Creason b. 22 Jun 1913, Chariton County, Missouri; d. 26 Jul 1959, Death Certificate: Gunshot wound to head. Gun discharged in cab of truck he was riding in. Accidental./Chariton Township, Chariton County, Missouri. 265. Emma Alice Creason b. Abt 1917, Missouri. 266. Allen Butler Creason b. 05 Dec 1919, Aholt, Chariton County, Missouri; d. 31 Jul 2006, Missouri. 267. Jennie Erl Creason b. 26 Nov 1894, Missouri; d. 14 Jan 1981; bur. Jan 1981, Lynn Cemetery/Camden, Schuyler County, Illinois. John Creason (72.Allen4, 15.Leroy3, 4.John2, 1.James1) b. 09 Sep 1871, Missouri. Benjamin Oscar Creason (72.Allen4, 15.Leroy3, 4.John2, 1.James1) b. 10 Mar 1873, Kentucky; d. 26 Aug 1952, South Gate, Los Angeles County, California. 268. Lucille Viola Creason b. 17 Jun 1903, Missouri; d. 05 Oct 1990, San Luis Obispo, California. 269. Benjamin Jr Creason b. 26 Jul 1913, Randolph County, Missouri; d. 02 Nov 1992, Long Beach, Los Angeles County, California. Mary Alice Creason (72.Allen4, 15.Leroy3, 4.John2, 1.James1) b. Abt 1875, Missouri. 270. Don Lusby b. Abt 1902, Missouri. 271. Lee Lusby b. Abt 1915, Missouri. Ola Creason (72.Allen4, 15.Leroy3, 4.John2, 1.James1) b. 1879. Laura Todd Creason (72.Allen4, 15.Leroy3, 4.John2, 1.James1) b. 10 Sep 1879, Chariton County, Missouri; d. 16 Feb 1942, Clay County, Missouri. 273. Nilene Florence Thacker b. 04 Jan 1912, Missouri; d. Aug 1984, SSDI: Nilene Flanery, SSN: 499-10-9797, Last Residence: 64068 Liberty, Clay, Missouri. BORN: 4 Jan 1912, Died: Aug 1984./Liberty, Clay County, Missouri. 274. Audra M Thacker b. Abt 1915, Missouri. 275. George William Thacker b. 28 Sep 1916, Liberty, Clay County, Missouri; d. 14 Nov 1949, Death Certificate: Skull fracture, industrial accident, hit by pile driver./Kansas City, Clay County, Missouri. 276. Everett Albert Thacker b. 07 May 1900, Chariton, Chariton County, Missouri; d. 13 Oct 1971, Kansas/Missouri; bur. 15 Oct 1971, Ft Leavenworth National Cemetery/Leavenworth County, Kansas. 277. Edward Thacker b. Abt 1903, Missouri; d. 28 Dec 1937, Los Angeles, Los Angeles County, California. Emma Creason (72.Allen4, 15.Leroy3, 4.John2, 1.James1) b. 10 Sep 1879, Missouri. Robert Edward Lee Creason (73.Sterling4, 15.Leroy3, 4.John2, 1.James1) b. 24 Mar 1867, Yolo County, California; d. 28 Aug 1908, Railroad Hospital (Obit)/Sacramento, Sacramento County, California; bur. Aug 1908, Knights Landing Cemetery/Knights Landing, Yolo County, California. 279. Floyd Merle Creason b. 16 Feb 1896, Knights Landing, Yolo County, California; d. 21 Mar 1980, Dunsmuir, Siskiyou County, California. 280. Violet Creason b. 23 Jun 1897, Tehama County, California; d. 01 Sep 1898, Tehama County, California. 281. Glenn Elwood Creason b. 30 Jun 1899, Tehama County, California; d. 19 Mar 1966, Martinez, Contra Costa County, California; bur. Mar 1966, Knights Landing Cemetery/Knights Landing, Yolo County, California. 282. Alice Creason b. 05 Aug 1902, Dunsmuir, Siskiyou County, California; d. 29 Oct 1998, Sacramento, Sacramento County, California. Mary "Mayme" Aletha Creason (73.Sterling4, 15.Leroy3, 4.John2, 1.James1) b. 30 Jan 1870, Yolo, Yolo County, California; d. 22 Feb 1955, California Death Index: Mary Aletha Edson, Birth Date: 30 Jan 1870, Birthplace: California, Death Date: 22 Feb 1955, Death Place: Yolo, Mother's Maiden Name: Taylor, Father's Surname: Cruson./Woodland, Yolo County, California; bur. Feb 1955, Knights Landing Cemetery/Knights Landing, Yolo County, California. 283. Lowell Francis Edson b. 10 Sep 1898, California; d. 10 Jan 1990, California Death Index: Lowell Francis Edson, Birth: 10 Sep 1898, California. Death: 10 Jan 1990, Yolo, Mother's Maiden Name: Creason./Yolo County, California. 284. Genevieve Edson b. 03 Dec 1900, Knights Landing, Yolo County, California; d. 01 Feb 1976, Woodland, Yolo County, California. Elizabeth "Lizzie" Creason (73.Sterling4, 15.Leroy3, 4.John2, 1.James1) b. 19 Sep 1872, Yolo County, California; d. 28 Nov 1890, Never married/; bur. Nov 1890, Knights Landing Cemetery/Knights Landing, Yolo County, California. Lemuel Creason (73.Sterling4, 15.Leroy3, 4.John2, 1.James1) b. Abt 1873, California; d. Bef 1900. Louisa "Lucy" Bush Creason (73.Sterling4, 15.Leroy3, 4.John2, 1.James1) b. 02 May 1875, California; d. 17 Jun 1963, California Death Index: Lucy B Mallett, Birth: 2 May 1875, California, Death: 17 Jun 1963, Riverside, Mother's Maiden Name: Taylor./Riverside, Riverside County, California; bur. Jun 1963, Fairhaven Memorial Park/Orange County, California. 285. Willie Sue White b. 28 Mar 1897, Calif; d. 07 Sep 1899, Tehama County, California; bur. Sep 1899, Tehama Cemetery/Tehama, Tehama County, California. James "Mat" Madison Creason (73.Sterling4, 15.Leroy3, 4.John2, 1.James1) b. 20 Mar 1877, California; d. 02 Mar 1960, California Death Index: James M Creason, Birth: 20 Mar 1877, California, Death: 2 Mar 1960, Tehama, Mother's Maiden Name: Taylor/Gerber, Tehama County, California; bur. Mar 1960, Oak Hill Cemetery/Red Bluff, Tehama County, California. 286. Earl Byron Creason b. 11 Nov 1903, SSDI: Earl Creason, SSN: 700-07-7320, Last Residence: 97540 Talent, Jackson, Oregon. BORN: 11 Nov 1903. Died: May 1973./California; d. 11 May 1973, Oregon Death Index: Earl B Creason, Age: 69, Birth Date: Nov 1903, Death Date: 11 May 1973, Death Place: Jackson. Spouse: Bernic. Certificate: 3-07507/Talent, Jackson County, Oregon; bur. May 1973, Siskiyou Cemetery/Medford, Jackson County, Oregon. 287. Alyce B Creason b. 24 Aug 1907, Ashland, Jackson County, Oregon; d. 26 Mar 1995, California Death Index: Alyce Creason White, Birth: 24 Aug 1907 Oregon, Death: 26 Mar 1995 San Mateo, Mother's Maiden Name: Tait, Father's Surname: Creason./San Mateo County, California; bur. Mar 1995, Mount Shasta Memorial Park/Mount Shasta, Siskiyou County, California. 288. Stanley Tait Creason b. 05 Sep 1909, Dunsmuir, Siskiyou County, California; d. 03 Feb 1991, Seattle, King County, Washington. 289. James Matthew Creason b. 05 Nov 1915, Weed, Siskiyou, California, USA; d. 18 Aug 1994, Calif Death Index: James Matthew Creason, SSN: 557015017, Birth Date: 5 Nov 1915, Birthplace: California, Death Date: 18 Aug 1994, Death Place: Contra Costa, Mother's Maiden Name: Tait./Contra Costa County, California. 290. Dorothy Marie Creason b. 19 Mar 1917, California Birth Index: Dorothy Marie Creason, Birth Date: 19 Mar 1917 Mother's Maiden Name: Tait, Birth County: Siskiyou/Weed, Siskiyou County, California. Thomas Jefferson "Jeff" Creason (73.Sterling4, 15.Leroy3, 4.John2, 1.James1) b. 30 Jun 1882, Dunnigan, Yolo County, California; d. 31 Jan 1966, Obituary lists wife as Mary. California Death Index: Thomas J Creason, Birth: 30 Jun 1882, California, Death: 31 Jan 1966, Ventura./Oxnard, Ventura County, California; bur. Jan 1966, Rose Hills Memorial Park, Mausoleum of the Valley, Sec 5, Lot D, Grave/Niche 107, Entrance Gate 10. Buried next to wife Mary./Whittier, Los Angeles County, California. Emma F twin Creason (73.Sterling4, 15.Leroy3, 4.John2, 1.James1) b. 02 Jan 1883, California; d. 13 Mar 1964, California Death Index: Emilie F Conley, Birth: 2 Jan 1883, Birth: California. Death: 13 Mar 1964, Fresno Co./Fresno County, California. 291. Jack "Ralph" Conley b. 20 Dec 1903, California; d. 15 Jun 1967, California Death Index: Jack S Conley, Birth: 20 Dec 1903, California. Death: 15 Jun 1967, Fresno Co., Mother's Maiden Name: Creason./Fresno County, California. 292. Dorthea J Conley b. 04 Nov 1905, California; d. 10 Jan 1977. Eleanor "Ella" F twin Creason (73.Sterling4, 15.Leroy3, 4.John2, 1.James1) b. 02 Jan 1883, California; d. 11 Jan 1959, California Death Index: Eleanor Fred Bradley, Birth: 2 Jan 1883, California. Death: 11 Jan 1959, Placer. Mother's Maiden Name: Taylor. Father's Surname: Creason./Lincoln, Placer County, California; bur. Jan 1959, East Lawn Cemetery/Sacramento, Sacramento County, California. 293. Muriel Wells b. 16 Apr 1902, Dunsmuir, Siskiyou County, California; d. 20 Jun 1995, California Death Index: Muriel Wells Kaminsky, Birth: 16 Apr 1902, California. Death: 20 Jun 1995, Death: Placer. Mother's Maiden Name: Creason. Father's Surname: Wells./Placer County, California. 294. George Sidney Wells b. 17 Oct 1903, Dunsmuir, Siskiyou County, California; d. 31 Aug 1973, San Jose, Santa Clara County, California. Edward "Ed" Price Creason (73.Sterling4, 15.Leroy3, 4.John2, 1.James1) b. 04 Apr 1885, Yolo County, California; d. 15 Dec 1981, Oregon Death Index: Edward Pri Creason, Age: 96, Birth Date: 3 Apr 1885, Death: 15 Dec 1981, Jackson Co. Spouse: Lillia. Certificate: 81-20333./Ashland, Jackson County, Oregon; bur. Dec 1981, Mountain View Cemetery/Ashland, Jackson County, Oregon. 295. Margaret Elizabeth Creason b. 31 Oct 1910, California Birth Index: Margaret E Creason, Birth: 31 Oct 1910. Mother's Maiden Name: Simmons. Birth County: Siskiyou./Dunsmuir, Siskiyou County, California; d. 22 Nov 1986, Margaret Elizabeth Fratis./Placer County, California; bur. Nov 1986, Sylvan Cemetery/Citrus Heights, Sacramento County, California. Earl Albert twin Creason (73.Sterling4, 15.Leroy3, 4.John2, 1.James1) b. 26 Jan 1889, California; d. 11 Jun 1973, California Death Index: Earl A Creason, Birth: 26 Jan 1889, California. Death: 11 Jun 1973, Siskiyou Co./Dunsmuir, Siskiyou County, California; bur. Jun 1973, Dunsmuir City Cemetery/Dunsmuir, Siskiyou County, California. Byron Jackson twin Creason (73.Sterling4, 15.Leroy3, 4.John2, 1.James1) b. 26 Jan 1889, California; d. 02 Aug 1909, Tuberculosis./Arizona; bur. Aug 1909, Tehama Cemetery/Tehama, Tehama County, California. Chester C Creason (75.Enos4, 15.Leroy3, 4.John2, 1.James1) b. 03 Aug 1874, West Grafton, Yolo County, California; d. 31 Oct 1935, Fresno Bee Republican Oct 31, 1935: Found dead on front lawn, apparent heart attack, 844 So. 4th St., Fresno./Fresno, Fresno County, California. 296. Maxine Helen twin Creason b. 06 Dec 1908, Sanger, Fresno County, California. 297. Maudine Elizabeth twin Creason b. 06 Dec 1908, California Birth Index: Maudine E Creason, Birth Date: 6 Dec 1908, Mother's Maiden Name: Maxwell, Birth County: Fresno./Sanger, Fresno County, California; d. 30 May 1972, California Death Index: Maudine E Moss, SSN: 554705366, Birth: 6 Dec 1908, California. Death: 30 May 1972, Los Angeles./Los Angeles County, California; bur. May 1972, Forest Lawn/Glendale, Los Angeles County, California. Myrtle Creason (75.Enos4, 15.Leroy3, 4.John2, 1.James1) b. 28 Aug 1876, Birth notice: Sacramento Daily Union, 30 August 1876: "Clarksburg, Yolo county, August 28--Wife of E. Creason, a daughter. "/Clarksburg, Yolo County, California; d. 17 Feb 1932, California Death Index: Myrtle Sloan, Birth Year: abt 1877. Death Date: 17 Feb 1932. Age at Death: 55. Death Place: Santa Barbara, California/Santa Barbara County, California. 298. Bernice Helen Sloan b. Apr 1896, California Birth Records: Bernice Helen Sloan. Birth: Apr 1896, Fresno, California. Father's Name: J E Sloan. Mother's name: Myrtle Creasen./Fresno County, California; d. 16 Apr 1981, Calif Death Index: Bernice Sloan Rhodehamel, SSN: 559011451, Birth Date: 13 Apr 1896, Birthplace: California, Death Date: 16 Apr 1981, Death Place: Santa Barbara, Mother's Maiden Name: Creason, Father's Surname: Sloan./Santa Barbara County, California. 299. Annie Sloan b. Abt 1905, California. 300. Ardis Sloan b. 14 Oct 1908, California; d. 31 Mar 1981, Calif Death Index: Ardis Sloan Bryant, SSN: 565680956, Birth Date: 14 Oct 1908, Birthplace: California, Death Date: 31 Mar 1981, Death Place: Santa Barbara, Mother's Maiden Name: Creason, Father's Surname: Sloan./Santa Barbara County, California. 301. Myrtle A Sloan b. 14 Oct 1908, California Birth Index: Myrtle A Sloan, Birth Date: 14 Oct 1908, Mother's Maiden Name: Creason, Birth County: Santa Barbara./Santa Barbara County, California. Linn Lester Creason (75.Enos4, 15.Leroy3, 4.John2, 1.James1) b. 24 Sep 1878, West Grafton, Yolo County, California; d. 13 Sep 1940, California Death Index: Linn Creason, Birth Date: 24 Sep 1878, Birthplace: California, Death Date: 13 Sep 1940, Death Place: Fresno, Mother's Maiden Name: Taylor, Father's Surname: Creason./Fresno, Fresno County, California. Jess Bates (78.Rhoda4, 15.Leroy3, 4.John2, 1.James1) b. May 1882, Missouri. Archibald Parish (78.Rhoda4, 15.Leroy3, 4.John2, 1.James1) b. 03 Jan 1871, Sullivan County, Missouri; d. 10 Feb 1944, St Joseph Hospital/St Joseph, Buchanan County, Missouri. Ira C "Bud" Parish (78.Rhoda4, 15.Leroy3, 4.John2, 1.James1) b. 25 Jun 1873, Milan City, Sullivan County, Missouri; d. 26 Oct 1955, Death Certificate: Died of pneumonia 16 days after receiving 1st and 2nd degree burns. Accident, bedding caught fire./St Joseph, Buchanan County, Missouri. 302. Goldie Parish b. Nov 1899, Missouri. 303. John Parish b. Abt 1902, Stewartsville, Dekalb County, Missouri. 304. Frederik "Fred" Parish b. Abt 1904, Missouri. 305. Theodore "Ted" Parish b. Abt 1906, Missouri. 306. Bessey Parish b. Abt 1909, Missouri. 307. Alice Parrish b. Abt 1915, Missouri. Chester A Parish (78.Rhoda4, 15.Leroy3, 4.John2, 1.James1) b. 17 May 1882, Sullivan County, Missouri; d. 02 Nov 1953, Death Certificate lists Chester as a widower./St Joseph, Buchanan County, Missouri. 308. Rhodabelle Parish b. Abt 1905, Missouri. Julyann C Crawford (79.Rachel4, 16.Hiram3, 4.John2, 1.James1) b. 1867, , , Missouri, USA. Robert Roark (79.Rachel4, 16.Hiram3, 4.John2, 1.James1) b. 1852, , Miller, Missouri, USA. Narcissa Roark (79.Rachel4, 16.Hiram3, 4.John2, 1.James1) b. 1854, , Miller, Missouri, USA. Martha J Roark (79.Rachel4, 16.Hiram3, 4.John2, 1.James1) b. 1856, , Miller, Missouri, USA. Mary C Roark (79.Rachel4, 16.Hiram3, 4.John2, 1.James1) b. 1857, , Miller, Missouri, USA. Charles Roark (79.Rachel4, 16.Hiram3, 4.John2, 1.James1) b. 15 Oct 1858, , Miller, Missouri, USA. Julia C Roark (79.Rachel4, 16.Hiram3, 4.John2, 1.James1) b. May 1859, , Miller, Missouri, USA. Boyd Clinton Roark (79.Rachel4, 16.Hiram3, 4.John2, 1.James1) b. 11 Mar 1862, Missouri; d. 11 Sep 1928, Miller County, Missouri. 309. Alonzo E Roark b. Jul 1890, Missouri. 310. Rosco Lewis Roark b. 21 Feb 1892, Missouri; d. 19 Jan 1977, Missouri. 311. Oliver R Roark b. May 1894, Missouri. 312. James E Roark b. Dec 1896, Missouri. 313. Arthur M Roark b. May 1899, Missouri. 314. Jesse A Roark b. 1903, Missouri. 315. Sarah E Roark b. 1905, Missouri. 316. William V Roark b. Abt 1909, Missouri. James Thomas Roark (79.Rachel4, 16.Hiram3, 4.John2, 1.James1) b. Jul 1872, , Miller, Missouri, USA; d. Grovis Mills, Creek, Oklahoma, USA. Leanna Roark (79.Rachel4, 16.Hiram3, 4.John2, 1.James1) b. 1875, , Miller, Missouri, USA. Mary Melsema Crane (79.Rachel4, 16.Hiram3, 4.John2, 1.James1) b. 02 Aug 1851, , Miller, Missouri, USA; d. 22 Apr 1922, , Miller, Missouri, USA. Brumley Harrison Crane (79.Rachel4, 16.Hiram3, 4.John2, 1.James1) b. 28 Dec 1851, Miller County, Missouri, USA; d. 19 Feb 1933, Jefferson, Cole County, Missouri. Albert P Crane (79.Rachel4, 16.Hiram3, 4.John2, 1.James1) b. 1856, , , Missouri, USA. Jeremiah "Jerry" M Crane (79.Rachel4, 16.Hiram3, 4.John2, 1.James1) b. 02 Nov 1859, Missouri; d. 16 Mar 1931, Death Certificate/Saline, Miller County, Missouri. 317. Stella Crane b. Abt 1886, Missouri. 318. Mary Crane b. Abt 1890, Missouri. 319. Minnie Crane b. Abt 1892, Missouri. 320. Annie Crane b. Abt 1895, Missouri. 321. Willie Crane b. Abt 1898, Missouri. 322. Homer Crane b. Abt 1901, Missouri. Lucy Lowe (82.Mary4, 18.William3, 4.John2, 1.James1) b. Abt 1875, Missouri. Katherine Lowe (82.Mary4, 18.William3, 4.John2, 1.James1) b. 1875, Missouri. Florence M Lowe (82.Mary4, 18.William3, 4.John2, 1.James1) b. Abt 1877, Lexington, Lafayette County, Missouri; d. 29 Sep 1955, Fulton County, Georgia. Minnie Bell Lowe (82.Mary4, 18.William3, 4.John2, 1.James1) b. Apr 1877, Lexington, Lafayette County, Missouri; d. 08 Sep 1947, Lafayette County, Missouri. 323. Robert Lee "Bob" Duncan b. 22 Jun 1896, Lexington, Lafayette County, Missouri; d. 01 Jul 1949, Lexington, Lafayette County, Missouri. 324. Minnie B Duncan b. 10 Aug 1900, Missouri; d. 19 May 1967. 325. Anna Irene Duncan b. Abt 1902, Missouri. 326. Gertrude "Gertie" M Duncan b. 07 Oct 1904, Lexington, Lafayette County, Missouri; d. 12 Dec 1929, Lexington, Lafayette County, Missouri. 327. William R "Bill" Duncan b. 15 Jan 1907, Missouri; d. 15 Jun 2001. 328. Addie Mae Duncan b. 19 Aug 1909, Born Ida Touchstone Duncan. At age 16 she had her name legally changed to Addie Mae Duncan. Source: granddaughter Lissa./Lafayette County, Missouri; d. 15 Apr 1985. 329. Mary L V Duncan b. 03 Feb 1912, Lexington, Lafayette County, Missouri; d. 07 Jan 1913, Lexington, Lafayette County, Missouri. 330. Dottie Reno Zero Duncan b. 28 Jan 1915, Missouri; d. 1970, Orrick, Ray County, Missouri. 331. Dollie Duncan b. 17 Oct 1917, Lexington, Lafayette County, Missouri; d. 07 Aug 1918, Lexington, Lafayette County, Missouri. Gertrude Blanche Lowe (82.Mary4, 18.William3, 4.John2, 1.James1) b. 04 Feb 1880, Lexington, Lafayette County, Missouri; d. 25 Apr 1926, San Diego County, California. Maude Mae Creason (83.John4, 20.James3, 4.John2, 1.James1) b. Aug 1886, Missouri. Mary Creason (83.John4, 20.James3, 4.John2, 1.James1) b. Sep 1869, Jefferson Township, Saline County, Missouri. Benjamin Franklin "Bud" Creason (83.John4, 20.James3, 4.John2, 1.James1) b. 07 Sep 1877, Missouri; d. 07 Jan 1926, Colorado. 332. Opal Obanetta Creason b. 01 Aug 1906, Pettis County, Missouri; d. 22 Oct 1911, Saline County, Missouri. 333. William Lawrence Creason b. 17 Jan 1911, Missouri; d. Nov 1985, Pueblo, Pueblo County, Colorado. 334. Mary Isabelle Creason b. Abt 1914, Missouri. 335. Irene I Creason b. Abt 1917, Missouri. 336. Clara Frances Creason b. 17 Mar 1918, Sedalia, Pettis County, Missouri; d. 04 Mar 1968, Pueblo County, Colorado. Viola E Creason (83.John4, 20.James3, 4.John2, 1.James1) b. 25 May 1879, Sedalia, Pettis County, Missouri; d. 02 Sep 1954, Silvis, Rock Island County, Illinois. Wilbern Burger (86.Sarah4, 24.John3, 5.James2, 1.James1) b. Abt 1866, Nebraska. Minnie M Burger (86.Sarah4, 24.John3, 5.James2, 1.James1) b. Abt 1867, Nebraska. John Edgar Burger (86.Sarah4, 24.John3, 5.James2, 1.James1) b. 29 Jan 1869, Hall County, Nebraska; d. 23 Jan 1939, Council Bluffs, Pottawattamie County, Iowa. Annie Burger (86.Sarah4, 24.John3, 5.James2, 1.James1) b. Abt 1871, Nebraska. Rhonda Burger (86.Sarah4, 24.John3, 5.James2, 1.James1) b. Abt 1873, Nebraska. Bertha Burger (86.Sarah4, 24.John3, 5.James2, 1.James1) b. Abt 1876, Nebraska. Myrtle Ida Burger (86.Sarah4, 24.John3, 5.James2, 1.James1) b. Abt 1878, Nebraska; d. 03 Apr 1932, Long Pine, Brown County, Nebraska. George Eli Burger (86.Sarah4, 24.John3, 5.James2, 1.James1) b. 01 Aug 1880, Doniphan, Hall County, Nebraska; d. 27 Jan 1937, Council Bluffs, Pottawattamie County, Iowa. Flora A Burger (87.Martha4, 24.John3, 5.James2, 1.James1) b. Abt 1868, Nebraska. John M H Burger (87.Martha4, 24.John3, 5.James2, 1.James1) b. Abt 1869. Nettie Burger (87.Martha4, 24.John3, 5.James2, 1.James1) b. Abt 1877, Nebraska. Albert D Burger (87.Martha4, 24.John3, 5.James2, 1.James1) b. Abt 1879, Nebraska. Clarence James Creason (88.James4, 24.John3, 5.James2, 1.James1) b. 23 Jun 1880, Nebraska; d. 27 Feb 1962, Colorado. 337. Maxwell P Creason b. Abt 1906, Nebraska. 338. Mervin F Creason b. Abt 1907, Nebraska. 339. Minta L Creason b. Abt 1909, Nebraska. 340. Jack T "Jay" Creason b. 06 Feb 1910, Nebraska; d. 07 Dec 1984, Calif Death Index: Jay T Creason, SSN: 523102878, Birth: 6 Feb 1910, Nebraska. Death: 7 Dec 1984, Napa County. Mother's Maiden Name: Wileman./Napa County, California; bur. Dec 1984, St Helena Cemetery/St Helena, Napa County, California. 341. Clarence Dorsey Creason b. 25 Dec 1912, Nebraska; d. 29 Oct 1955, California Death Index: Clarence Dorsey Creason, Birth: 25 Dec 1912, Colorado. Death: 29 Oct 1955, Napa County. Mother's Maiden Name: Wellman. Father's Surname: Creason./Napa County, California. 342. Leland Robert Creason b. 01 Jan 1917, Nebraska; d. 04 Mar 1987, Los Angeles County, California; bur. Mar 1987, El Dorado Public Cemetery/El Dorado, El Dorado County, California. 343. Carl Hubert Creason b. 19 Jun 1919, Nebraska; d. 27 Dec 1953; bur. Dec 1953, Elmwood Cemetery/Fruita, Mesa County, Colorado. 344. Floyd G Creason b. Abt 1922, Colorado. Rhoda Ethel Creason (88.James4, 24.John3, 5.James2, 1.James1) b. Abt 1882, Nebraska. 346. Fern C Karr b. 1902, Nebraska. 347. Ralph O Karr b. Abt 1905, Nebraska. 348. Gertrude A Karr b. 1908, Nebraska. Frederick "Fred" Creason (88.James4, 24.John3, 5.James2, 1.James1) b. Jul 1885, Nebraska. 349. Loren G Creason b. Abt 1909, Nebraska. 350. Floyd J Creason b. Abt 1909, Nebraska. 351. Lyle Creason b. Abt 1910, Nebraska. 352. Eileen Creason b. Abt 1918, Nebraska. Arthur A Creason (88.James4, 24.John3, 5.James2, 1.James1) b. Apr 1888, Nebraska. 353. Mary Creason b. Abt 1912, Nebraska. 354. Marion Creason b. Abt 1914, Nebraska. 355. Doris Creason b. Abt 1915, Nebraska. Della Abigail Creason (89.John4, 24.John3, 5.James2, 1.James1) b. 09 Sep 1870, Doniphan County, Nebraska; d. 16 Mar 1960, Castle Rock, Douglas County, Colorado. Charles Franklin Creason (89.John4, 24.John3, 5.James2, 1.James1) b. 08 Mar 1873, Doniphan, Hall County, Nebraska; d. 24 Dec 1950, Seattle, King County, Washington. Willie Creason (89.John4, 24.John3, 5.James2, 1.James1) b. 24 Nov 1874, Doniphan, Hall County, Nebraska; d. 06 Oct 1875, Doniphan, Hall County, Nebraska. Harvey Edgar Creason (89.John4, 24.John3, 5.James2, 1.James1) b. 06 Aug 1876, Nebraska; d. Jan 1965, Kearney County, Nebraska. Kitty May Creason (89.John4, 24.John3, 5.James2, 1.James1) b. 01 Jun 1878, Nebraska; d. Jan 1973, Glenwood, Mills County, Iowa. Lillie Maud Creason (89.John4, 24.John3, 5.James2, 1.James1) b. 20 Mar 1881, Doniphan, Hall County, Nebraska; d. 25 May 1976, Council Bluffs, Pottawattamie County, Iowa. 356. Gerald Grant Young b. 30 Apr 1906, Hastings, Mills County, Iowa. Fanny A Creason (89.John4, 24.John3, 5.James2, 1.James1) b. Mar 1883, Nebraska; d. 02 Dec 1971, Seattle, King County, Washington. Josephine B "Josie" Creason (89.John4, 24.John3, 5.James2, 1.James1) b. Oct 1884, Doniphan County, Nebraska. Iva Caroline Creason (89.John4, 24.John3, 5.James2, 1.James1) b. 15 Mar 1888, Nebraska; d. 29 Nov 1949, Los Angeles, Los Angeles County, California. Nota M Creason (89.John4, 24.John3, 5.James2, 1.James1) b. Jul 1890, Nebraska. Lulu May Denman (92.Mariah4, 24.John3, 5.James2, 1.James1) b. 25 Jul 1875, Nebraska. John Hayes Denman (92.Mariah4, 24.John3, 5.James2, 1.James1) b. 07 Nov 1876, Nebraska. Laura Ida Denman (92.Mariah4, 24.John3, 5.James2, 1.James1) b. 21 Jun 1879, Nebraska. Robert Burdette Denman (92.Mariah4, 24.John3, 5.James2, 1.James1) b. 23 Aug 1881, Nebraska. Joseph McKinley Denman (92.Mariah4, 24.John3, 5.James2, 1.James1) b. 17 Dec 1891, Nebraska. Thomas Leroy Moody (99.Thomas5, 49.George4, 11.John3, 2.Judith2, 1.James1) b. 12 Jan 1888, Laton, Fresno County, California; d. 03 Feb 1973, Hatboro, Montgomery county, Pennsylvania. 357. Eileen Maureen Moody b. 26 Oct 1919, Pennsylvania; d. 23 Mar 1989, Hatboro, Montgomery county, Pennsylvania. 358. Thomas Leroy Moody b. Abt 1920, Philadelphia, Pennsylvania; d. Abt 1935, Philadelphia, Pennsylvania. Charlie Creason (109.Robert5, 68.James4, 15.Leroy3, 4.John2, 1.James1) b. 1880, Sullivan County, Missouri; d. 07 Sep 1880, Sullivan County, Missouri; bur. Sep 1880, Hoover Cemetery. CREASON, Charlie, – 7 Sep 1880, Son of R.A. & E.P. Creason. http://sullivan.mogenweb.org/cemeteries/Hoover_Cemetery.html/Browning, Sullivan County, Missouri. James E Creason (109.Robert5, 68.James4, 15.Leroy3, 4.John2, 1.James1) b. 06 Sep 1881, Missouri; d. 10 Mar 1958; bur. Mar 1958, Locust Valley Cemetery/Sullivan County, Missouri. 359. Hazel Creason b. Abt 1908, Missouri. Eva Lena Creason (109.Robert5, 68.James4, 15.Leroy3, 4.John2, 1.James1) b. 09 Dec 1882, Missouri; d. 28 Feb 1959, Browning, Linn County, Missouri; bur. Feb 1959, Locust Valley Cemetery/Sullivan County, Missouri. William Frank Creason (109.Robert5, 68.James4, 15.Leroy3, 4.John2, 1.James1) b. 09 Oct 1884, Missouri; d. 04 Nov 1963, Milan, Sullivan County, Missouri; bur. Nov 1963, Hoover Cemetery/Browning, Sullivan County, Missouri. Beverly Dickenson Creason (109.Robert5, 68.James4, 15.Leroy3, 4.John2, 1.James1) b. 10 Feb 1886, Sullivan County, Missouri; d. 08 Feb 1956, Browning, Linn County, Missouri. 360. Dowell D Creason b. Abt 1913, Missouri. 361. V Moline Creason b. Abt 1918, Missouri. 362. Truman J Creason b. Abt 1921, Missouri. 363. Doris V Creason b. Abt 1923, Missouri. Malissa "Lissie" Mae Creason (109.Robert5, 68.James4, 15.Leroy3, 4.John2, 1.James1) b. 06 Mar 1889, Missouri; d. 04 Nov 1918, Died of influenza./Brookfield, Linn County, Missouri. Frances Creason (109.Robert5, 68.James4, 15.Leroy3, 4.John2, 1.James1) b. Jun 1891, Missouri. Belva A Creason (109.Robert5, 68.James4, 15.Leroy3, 4.John2, 1.James1) b. Aug 1892, Missouri. Pearl Creason (109.Robert5, 68.James4, 15.Leroy3, 4.John2, 1.James1) b. Apr 1894, Missouri; d. 1977, Missouri; bur. 1977, Hoover Cemetery/Browning, Sullivan County, Missouri. Veda Rachel Creason (109.Robert5, 68.James4, 15.Leroy3, 4.John2, 1.James1) b. May 1896, Missouri. Grace A Creason (109.Robert5, 68.James4, 15.Leroy3, 4.John2, 1.James1) b. 12 Aug 1898, Missouri; d. 05 Nov 1918, Died of influenza./Duncan, Sullivan County, Missouri. Ralph Creason (109.Robert5, 68.James4, 15.Leroy3, 4.John2, 1.James1) b. Abt 1901, Missouri. Sylvia Creason (111.Leroy5, 68.James4, 15.Leroy3, 4.John2, 1.James1) b. 08 Feb 1887, Missouri; d. 02 Dec 1889, Missouri. Alva Creason (111.Leroy5, 68.James4, 15.Leroy3, 4.John2, 1.James1) b. 1889, Missouri; d. 05 Mar 1890, Missouri; bur. Mar 1890, Hoover Cemetery. CREASON, Alva, 1889 – 5 Mar 1890, Son of L.F.& N.E. Creason. http://sullivan.mogenweb.org/cemeteries/Hoover_Cemetery.html/Browning, Sullivan County, Missouri. Ola F Creason (111.Leroy5, 68.James4, 15.Leroy3, 4.John2, 1.James1) b. 28 Apr 1891, Scottsville, Sullivan County, Missouri; d. 02 May 1965, Purdin, Linn County, Missouri. 364. Dorothy L Creason b. Abt 1916. 365. Nolan M Creason b. 17 Sep 1916, Purdin, Linn County, Missouri; d. 16 Nov 1992, Carlsbad, Eddy County, New Mexico. 366. Martha E Creason b. Abt 1918. Bula M Creason (111.Leroy5, 68.James4, 15.Leroy3, 4.John2, 1.James1) b. Abt 1902, Missouri. Allie Creason (112.Walter5, 68.James4, 15.Leroy3, 4.John2, 1.James1) b. 18 Aug 1889, Sullivan County, Missouri; d. 18 Mar 1930, Brookfield, Linn County, Missouri. Iva Creason (112.Walter5, 68.James4, 15.Leroy3, 4.John2, 1.James1) b. Abt 1891, Missouri. Walter "Roy" LeRoy Creason (112.Walter5, 68.James4, 15.Leroy3, 4.John2, 1.James1) b. 19 Mar 1893, Browning, Linn County, Missouri; d. 08 Jun 1963, Obituary/Meadville, Linn County, Missouri. 369. Gerald Jerome Creason b. 21 Jun 1920, Purdin, Linn County, Missouri; d. 26 Jan 1999, Saint George, Washington County, Utah; bur. Jan 1999, Larkin Sunset Gardens/Salt Lake City, Salt Lake County, Utah. 370. Walter Ray twin Creason b. 11 Feb 1926, Linneus, Linn County, Missouri; d. 09 Jan 2009, Lexington, Lafayette County, Missouri. 371. Mary Ramah twin Creason b. 11 Feb 1926, Missouri; d. 19 Jan 2002, Richmond, Ray County, Missouri. Bozela Creason (113.Homer5, 68.James4, 15.Leroy3, 4.John2, 1.James1) b. Feb 1894, Missouri. Elma Ethel Creason (113.Homer5, 68.James4, 15.Leroy3, 4.John2, 1.James1) b. Feb 1896, Missouri. Arley Creason (113.Homer5, 68.James4, 15.Leroy3, 4.John2, 1.James1) b. 06 Jun 1898, Sullivan County, Missouri; d. 17 Dec 1899, Sullivan County, Missouri; bur. Dec 1899, Hoover Cemetery. CREASON, Arley, 6 Jun 1898 – 17 Dec1899. Child of H.E. & Maggie Creason. http://sullivan.mogenweb.org/cemeteries/Hoover_Cemetery.html/Browning, Sullivan County, Missouri. George Lawrence Creason (113.Homer5, 68.James4, 15.Leroy3, 4.John2, 1.James1) b. Abt 1901, Missouri. William R Hatcher (116.Margaret5, 69.Elizabeth4, 15.Leroy3, 4.John2, 1.James1) b. Dec 1875, California. Grace E Hatcher (116.Margaret5, 69.Elizabeth4, 15.Leroy3, 4.John2, 1.James1) b. Jan 1878, California. Hanna E Hatcher (116.Margaret5, 69.Elizabeth4, 15.Leroy3, 4.John2, 1.James1) b. Aug 1884, California. Mary Ruby Smith (121.Hester5, 70.Collison4, 15.Leroy3, 4.John2, 1.James1) b. Jun 1887, Missouri. Eunice Georgia Smith (121.Hester5, 70.Collison4, 15.Leroy3, 4.John2, 1.James1) b. 18 Jan 1891, Milan, Sullivan County, Missouri; d. 24 Jan 1959, Calif Death Index: Eunice Raley, Birth: 18 Jan 1891, Missouri, Death: 24 Jan 1959, Sacramento County. Mother's Maiden Name: Creason, Father's Surname: Smith./Sacramento County, California. 372. Wayne Clifton Raley b. 12 Jun 1917, Mason, Lyon County, Nevada; d. 14 Apr 1988, Calif Death Index: Wayne Clifton Raley, Social Security #: 545281641, Birth: 12 Jun 1917, Nevada. Death: 14 Apr 1988, Yolo County. Mother's Maiden Name: Smith./West Sacramento, Yolo County, California. 373. Elaine Raley b. 13 Feb 1920, California Birth Index: Elaine Raley, Birth Date: 13 Feb 1920, Mother's Maiden Name: Smith, Birth County: Kern./Kern County, California. Jean Creason Smith (121.Hester5, 70.Collison4, 15.Leroy3, 4.John2, 1.James1) b. 18 Nov 1900, Missouri; d. 28 Jun 1960, California Death Index: Jean C Smith, Birth: 18 Nov 1901, Missouri, Death: 28 Jun 1960, Los Angeles, Mother's Maiden Name: Creason./Los Angeles County, California. Alice M Smith (121.Hester5, 70.Collison4, 15.Leroy3, 4.John2, 1.James1) b. Abt 1904, Missouri. Hazel Creason (122.Leonard5, 70.Collison4, 15.Leroy3, 4.John2, 1.James1) b. 10 Jun 1898, Milan, Sullivan County, Missouri; d. 17 Oct 1911, Death Certificate: Perforation of bowel from typhoid fever./Milan, Sullivan County, Missouri; bur. 18 Oct 1911, Death Certificate/Oakwood Cemetery, Milan, Sullivan County, Missouri. Gerald Creason (122.Leonard5, 70.Collison4, 15.Leroy3, 4.John2, 1.James1) b. 05 Feb 1900, Milan, Sullivan County, Missouri; d. 18 Sep 1918, Death Certificate: Pulmonary tuberculosis./Milan, Sullivan County, Missouri; bur. 19 Sep 1918, Death Certificate/Oakwood Cemetery, Milan, Sullivan County, Missouri. Leonard Lee "Hoot" Creason, Jr. (122.Leonard5, 70.Collison4, 15.Leroy3, 4.John2, 1.James1) b. 19 Aug 1904, Sullivan County, Missouri; d. 23 Feb 1944, California Death Index: Leonard Lee Creason, SSN: 562036564, Birth Date: 19 Aug 1904, Birthplace: Missouri, Death Date: 23 Feb 1944, Death Place: San Diego, Mother's Maiden Name: Parrish, Father's Surname: Creason./San Diego County, California. 374. Barbara Lee Creason b. 23 Feb 1932, Los Angeles Time birth announcement on 2 Mar 1932/Los Angeles County, California; d. 17 Jul 1987, California Death Index: Barbara Lee Lyons./Los Angeles County, California. Kenneth Carroll Creason (122.Leonard5, 70.Collison4, 15.Leroy3, 4.John2, 1.James1) b. 02 Jun 1908, Milan, Sullivan County, Missouri; d. 02 Aug 2003, Tustin, Orange County, California; bur. Aug 2003, Rose Hills Memorial Park, Garden of Reflection Lawn, Sec 17 Lot 380. Grave/Niche 4. Entrance Gate 1./Whittier, Los Angeles County, California. 375. Robert Kenneth Creason b. 23 Oct 1931, Cook County Birth Index: Robert Creason, Birth Date: 23 Oct 1931, Birth Location: Cook County, IL, File Number: 6043616./Chicago, Cook County, Illinois; d. 12 Feb 1983, Calif Death Index: Robert Kenneth Creason, SSN: 559387766, Birth Date: 23 Oct 1931, Birthplace: Illinois, Death Date: 12 Feb 1983, Death Place: Los Angeles, Mother's Maiden Name: Lawrence./1624 S Meridian, Alhambra, Los Angeles County, California. 377. Carole Ruth Creason b. 03 Nov 1941, San Gabriel, Los Angeles County, California; d. 24 Jul 2005, Lake Forest, Orange County, California. John Logan Jr Creason (123.John5, 70.Collison4, 15.Leroy3, 4.John2, 1.James1) b. 04 Jul 1912, Milan, Sullivan County, Missouri; d. 24 Aug 1912, Died as infant. Death certificate cited "Not fed intelligently. "/Milan, Sullivan County, Missouri. Frank Proctor Nelson (124.Mary5, 70.Collison4, 15.Leroy3, 4.John2, 1.James1) b. 15 Aug 1878, California; d. 16 Dec 1950, Los Angeles County, California. 378. Frances M Nelson b. 15 Dec 1905, California Birth Index: Frances N Nelson, Birth Date: 15 Dec 1905, Gender: Female, Mother's Maiden Name: Manning, Birth County: Fresno./Fresno County, California. 379. Joseph J Nelson b. 21 May 1909, California Birth Index: Joseph J Nelson, Birth Date: 21 May 1909, Mother's Maiden Name: Manning, Birth County: Fresno./Fresno County, California. Aimee Nelson (124.Mary5, 70.Collison4, 15.Leroy3, 4.John2, 1.James1) b. 08 Jun 1883, California; d. 08 Feb 1944, Los Angeles County, California. Frances Creason (125.Charles5, 70.Collison4, 15.Leroy3, 4.John2, 1.James1) b. 23 Apr 1891, California; d. 14 Mar 1942, California Death Index: Frances C Greene, Birth: 23 Apr 1891, California. Death: 14 Mar 1942, San Francisco. Mother's Maiden Name: Scott, Father's Surname: Creason./San Francisco County, California. Thomas Creason (125.Charles5, 70.Collison4, 15.Leroy3, 4.John2, 1.James1) b. Abt 1892, California. Jessie W Creason (126.Albert5, 70.Collison4, 15.Leroy3, 4.John2, 1.James1) b. Apr 1893, California; d. 1924, California Death Index: Jessie Rouch, Death: 11 Jan 1924, Age at Death: 30, Death Place: Fresno, California/Kingsburg, Fresno County, California. 380. Herbert Alva Rouch b. 16 Feb 1917, Fresno County, California; d. 06 Jul 1998, Fresno County, California. 381. Melvin R Rouch b. 29 Dec 1918, Fresno County, California; d. May 1943, North Africa. 382. Doris E Rouch b. Abt 1921, California. Lester Alexander Creason (126.Albert5, 70.Collison4, 15.Leroy3, 4.John2, 1.James1) b. 31 Mar 1895, Sacramento County, California; d. 01 Aug 1965, California Death Index: Lester A Creason, Birth: 31 Mar 1895, California, Death: 1 Aug 1965, Contra Costa County, Mother's Maiden Name: Pyllman./Antioch, Contra Costa County, California; bur. Aug 1965, Memory Gardens Cemetery/Concord, Contra Costa County, California. 383. Elizabeth Louise "Betty" Creason b. 05 Apr 1918, Kern County, California; d. 12 Oct 1989, Calif Death Index: Elisabeth Louise Hood, SSN#: 559099472, Birth: 5 Apr 1918, California. Death: 12 Oct 1989, Alameda County. Mother's Maiden Name: Becker, Father's Surname: Creason./Alameda County, California. 384. Mildred Creason b. Abt 1921. 385. Living b. 15 Feb 1923. Byron Albert Creason (126.Albert5, 70.Collison4, 15.Leroy3, 4.John2, 1.James1) b. 16 Apr 1896, Fresno County, California; d. 10 Apr 1931, California Death Index: Byron Creason, Death: 10 Apr 1931, Age at Death: 34, Death Place: Fresno, California./Fresno County, California; bur. Apr 1931, Kingsburg Cemetery/Kingsburg, Fresno County, California. Albert Creason (126.Albert5, 70.Collison4, 15.Leroy3, 4.John2, 1.James1) b. 28 Feb 1898, Fresno County, California; d. 30 May 1899, Fresno County, California; bur. May 1899, Kingsburg Cemetery/Kingsburg, Fresno County, California. Charlotte "Lottie" Marie Creason (126.Albert5, 70.Collison4, 15.Leroy3, 4.John2, 1.James1) b. 18 Feb 1901, Charlotte Marie Creason, Birth: 18 Feb 1901, Fresno, California. Father's Name: Alexander Creason, Mother's name: Ida May Pylman./Fresno County, California; d. 13 May 1968, Died in car accident per granddaughter. California Death Index: Lottie M Phillips, Birth: 18 Feb 1901, California. Death: 13 May 1968, Tulare. Mother's Maiden Name: Palman./Tulare County, California. 386. Ben "Benny" A Phillips b. 29 Jul 1926, California Birth Index: Benny Phillips Birth Date: 29 Jul 1926, Mother's Maiden Name: Creason, Birth County: San Mateo./San Mateo County, California; d. 21 Dec 1998, Felton, Santa Cruz County, California. 387. Russell Thomas Phillips b. 20 Apr 1928, California Birth Index: Russell Thomas Phillips, Birth Date: 20 Apr 1928, Mother's Maiden Name: Creason, Birth County: Kings./Kings County, California; d. 31 Dec 1987, Fresno County, California. 388. Howard Dale Phillips b. 07 Jan 1930, California Birth Index: Howard Dale Phillips, Birth Date: 7 Jan 1930, Mother's Maiden Name: Creason Birth County: Kings./Kings County, California; d. 10 Jul 2000, Kerman, Fresno County, California. 389. Robert Lee "Bobby" Phillips b. 12 Dec 1931, California Birth Index: Robert Lee Phillips, Birth Date: 12 Dec 1931, Mother's Maiden Name: Creason, Birth County: Fresno./Fresno County, California; d. 27 Sep 2004, Fresno, Fresno County, California. Homer E Creason (127.George5, 72.Allen4, 15.Leroy3, 4.John2, 1.James1) b. 1901, Missouri. 392. Homer Creason b. 20 Oct 1923, Calif Birth Index: Homer Creason, 20 Oct 1923, Los Angeles County, Mother's Maiden Name: Muir/Los Angeles County, California. Nylene Arvelee Creason (127.George5, 72.Allen4, 15.Leroy3, 4.John2, 1.James1) b. 16 Sep 1901, Missouri; d. 01 Aug 1981, California Death Index: Nylene Arvelee Villasenor, Birth: 16 Sep 1901, Missouri. Death: 1 Aug 1981, Orange Co. Mother's Maiden Name: Sheppard. Father's Surname: Creason./Orange County, California. Virgil C Creason (127.George5, 72.Allen4, 15.Leroy3, 4.John2, 1.James1) b. 11 Apr 1904, Missouri; d. 22 Nov 1972, San Diego County, California. Floy Creason (128.Robert5, 72.Allen4, 15.Leroy3, 4.John2, 1.James1) b. Feb 1899, Missouri. Robert J Creason (128.Robert5, 72.Allen4, 15.Leroy3, 4.John2, 1.James1) b. Abt 1901, Missouri. Herbert Creason (128.Robert5, 72.Allen4, 15.Leroy3, 4.John2, 1.James1) b. Abt 1904, Missouri. Kelley Creason (128.Robert5, 72.Allen4, 15.Leroy3, 4.John2, 1.James1) b. Abt 1906, Missouri. Bethel Creason (128.Robert5, 72.Allen4, 15.Leroy3, 4.John2, 1.James1) b. 13 Jul 1907, Missouri; d. 31 Aug 1993, SSDI: Bethel D. Kuhn, SSN: 499-24-8336, Last Residence: 65254 Glasgow, Howard, Missouri. BORN: 13 Jul 1907, Died: 31 Aug 1993/Glasgow, Howard County, Missouri. Hester Creason (128.Robert5, 72.Allen4, 15.Leroy3, 4.John2, 1.James1) b. Abt 1912, Missouri. Sylvia Gale "Ben" Creason (128.Robert5, 72.Allen4, 15.Leroy3, 4.John2, 1.James1) b. 22 Jun 1913, Chariton County, Missouri; d. 26 Jul 1959, Death Certificate: Gunshot wound to head. Gun discharged in cab of truck he was riding in. Accidental./Chariton Township, Chariton County, Missouri. 394. Sylvia Gale "Delbert" Creason b. 09 Aug 1941, Glasgow, Howard County, Missouri; d. 16 Jul 1956, Death Certificate: Killed by electrical shock while working on wires./Missouri Township, Chariton County, Missouri. Emma Alice Creason (128.Robert5, 72.Allen4, 15.Leroy3, 4.John2, 1.James1) b. Abt 1917, Missouri. Allen Butler Creason (128.Robert5, 72.Allen4, 15.Leroy3, 4.John2, 1.James1) b. 05 Dec 1919, Aholt, Chariton County, Missouri; d. 31 Jul 2006, Missouri. Jennie Erl Creason (128.Robert5, 72.Allen4, 15.Leroy3, 4.John2, 1.James1) b. 26 Nov 1894, Missouri; d. 14 Jan 1981; bur. Jan 1981, Lynn Cemetery/Camden, Schuyler County, Illinois. 395. Fred Lynn b. 23 Apr 1915, Rushville, Schuyler County, Illinois. Lucille Viola Creason (130.Benjamin5, 72.Allen4, 15.Leroy3, 4.John2, 1.James1) b. 17 Jun 1903, Missouri; d. 05 Oct 1990, San Luis Obispo, California. Benjamin Jr Creason (130.Benjamin5, 72.Allen4, 15.Leroy3, 4.John2, 1.James1) b. 26 Jul 1913, Randolph County, Missouri; d. 02 Nov 1992, Long Beach, Los Angeles County, California. Don Lusby (131.Mary5, 72.Allen4, 15.Leroy3, 4.John2, 1.James1) b. Abt 1902, Missouri. Lee Lusby (131.Mary5, 72.Allen4, 15.Leroy3, 4.John2, 1.James1) b. Abt 1915, Missouri. Nilene Florence Thacker (133.Laura5, 72.Allen4, 15.Leroy3, 4.John2, 1.James1) b. 04 Jan 1912, Missouri; d. Aug 1984, SSDI: Nilene Flanery, SSN: 499-10-9797, Last Residence: 64068 Liberty, Clay, Missouri. BORN: 4 Jan 1912, Died: Aug 1984./Liberty, Clay County, Missouri. Audra M Thacker (133.Laura5, 72.Allen4, 15.Leroy3, 4.John2, 1.James1) b. Abt 1915, Missouri. George William Thacker (133.Laura5, 72.Allen4, 15.Leroy3, 4.John2, 1.James1) b. 28 Sep 1916, Liberty, Clay County, Missouri; d. 14 Nov 1949, Death Certificate: Skull fracture, industrial accident, hit by pile driver./Kansas City, Clay County, Missouri. Everett Albert Thacker (133.Laura5, 72.Allen4, 15.Leroy3, 4.John2, 1.James1) b. 07 May 1900, Chariton, Chariton County, Missouri; d. 13 Oct 1971, Kansas/Missouri; bur. 15 Oct 1971, Ft Leavenworth National Cemetery/Leavenworth County, Kansas. Edward Thacker (133.Laura5, 72.Allen4, 15.Leroy3, 4.John2, 1.James1) b. Abt 1903, Missouri; d. 28 Dec 1937, Los Angeles, Los Angeles County, California. Floyd Merle Creason (135.Robert5, 73.Sterling4, 15.Leroy3, 4.John2, 1.James1) b. 16 Feb 1896, Knights Landing, Yolo County, California; d. 21 Mar 1980, Dunsmuir, Siskiyou County, California. 405. Dorothy La Jean Creason b. 07 Apr 1921, California Birth Index: Dorothy L Creason, Birth Date: 7 Apr 1921, Mother's Maiden Name: Good, Birth County: Siskiyou./Siskiyou County, California. Violet Creason (135.Robert5, 73.Sterling4, 15.Leroy3, 4.John2, 1.James1) b. 23 Jun 1897, Tehama County, California; d. 01 Sep 1898, Tehama County, California. Glenn Elwood Creason (135.Robert5, 73.Sterling4, 15.Leroy3, 4.John2, 1.James1) b. 30 Jun 1899, Tehama County, California; d. 19 Mar 1966, Martinez, Contra Costa County, California; bur. Mar 1966, Knights Landing Cemetery/Knights Landing, Yolo County, California. Alice Creason (135.Robert5, 73.Sterling4, 15.Leroy3, 4.John2, 1.James1) b. 05 Aug 1902, Dunsmuir, Siskiyou County, California; d. 29 Oct 1998, Sacramento, Sacramento County, California. 406. Lois Ann Wells b. 26 Apr 1922, Siskiyou County, California. Lowell Francis Edson (136.Mary5, 73.Sterling4, 15.Leroy3, 4.John2, 1.James1) b. 10 Sep 1898, California; d. 10 Jan 1990, California Death Index: Lowell Francis Edson, Birth: 10 Sep 1898, California. Death: 10 Jan 1990, Yolo, Mother's Maiden Name: Creason./Yolo County, California. 407. Genevieve Edson b. 12 Nov 1922. Genevieve Edson (136.Mary5, 73.Sterling4, 15.Leroy3, 4.John2, 1.James1) b. 03 Dec 1900, Knights Landing, Yolo County, California; d. 01 Feb 1976, Woodland, Yolo County, California. Willie Sue White (139.Louisa5, 73.Sterling4, 15.Leroy3, 4.John2, 1.James1) b. 28 Mar 1897, Calif; d. 07 Sep 1899, Tehama County, California; bur. Sep 1899, Tehama Cemetery/Tehama, Tehama County, California. Earl Byron Creason (140.James5, 73.Sterling4, 15.Leroy3, 4.John2, 1.James1) b. 11 Nov 1903, SSDI: Earl Creason, SSN: 700-07-7320, Last Residence: 97540 Talent, Jackson, Oregon. BORN: 11 Nov 1903. Died: May 1973./California; d. 11 May 1973, Oregon Death Index: Earl B Creason, Age: 69, Birth Date: Nov 1903, Death Date: 11 May 1973, Death Place: Jackson. Spouse: Bernic. Certificate: 3-07507/Talent, Jackson County, Oregon; bur. May 1973, Siskiyou Cemetery/Medford, Jackson County, Oregon. 409. Marjorie Berniece Creason b. 11 Nov 1932, Calif Birth Index: Marjorie Berniece Creason, Birth Date: 11 Nov 1932, Mother's Maiden Name: Jones, Birth County: Siskiyou./Siskiyou County, California; d. 01 Jan 2002, Medford, Jackson County, Oregon. Alyce B Creason (140.James5, 73.Sterling4, 15.Leroy3, 4.John2, 1.James1) b. 24 Aug 1907, Ashland, Jackson County, Oregon; d. 26 Mar 1995, California Death Index: Alyce Creason White, Birth: 24 Aug 1907 Oregon, Death: 26 Mar 1995 San Mateo, Mother's Maiden Name: Tait, Father's Surname: Creason./San Mateo County, California; bur. Mar 1995, Mount Shasta Memorial Park/Mount Shasta, Siskiyou County, California. Stanley Tait Creason (140.James5, 73.Sterling4, 15.Leroy3, 4.John2, 1.James1) b. 05 Sep 1909, Dunsmuir, Siskiyou County, California; d. 03 Feb 1991, Seattle, King County, Washington. James Matthew Creason (140.James5, 73.Sterling4, 15.Leroy3, 4.John2, 1.James1) b. 05 Nov 1915, Weed, Siskiyou, California, USA; d. 18 Aug 1994, Calif Death Index: James Matthew Creason, SSN: 557015017, Birth Date: 5 Nov 1915, Birthplace: California, Death Date: 18 Aug 1994, Death Place: Contra Costa, Mother's Maiden Name: Tait./Contra Costa County, California. Dorothy Marie Creason (140.James5, 73.Sterling4, 15.Leroy3, 4.John2, 1.James1) b. 19 Mar 1917, California Birth Index: Dorothy Marie Creason, Birth Date: 19 Mar 1917 Mother's Maiden Name: Tait, Birth County: Siskiyou/Weed, Siskiyou County, California. Jack "Ralph" Conley (142.Emma5, 73.Sterling4, 15.Leroy3, 4.John2, 1.James1) b. 20 Dec 1903, California; d. 15 Jun 1967, California Death Index: Jack S Conley, Birth: 20 Dec 1903, California. Death: 15 Jun 1967, Fresno Co., Mother's Maiden Name: Creason./Fresno County, California. Dorthea J Conley (142.Emma5, 73.Sterling4, 15.Leroy3, 4.John2, 1.James1) b. 04 Nov 1905, California; d. 10 Jan 1977. Muriel Wells (143.Eleanor5, 73.Sterling4, 15.Leroy3, 4.John2, 1.James1) b. 16 Apr 1902, Dunsmuir, Siskiyou County, California; d. 20 Jun 1995, California Death Index: Muriel Wells Kaminsky, Birth: 16 Apr 1902, California. Death: 20 Jun 1995, Death: Placer. Mother's Maiden Name: Creason. Father's Surname: Wells./Placer County, California. 416. Beverly Kaminsky b. 22 Dec 1934; d. 24 Sep 1985. George Sidney Wells (143.Eleanor5, 73.Sterling4, 15.Leroy3, 4.John2, 1.James1) b. 17 Oct 1903, Dunsmuir, Siskiyou County, California; d. 31 Aug 1973, San Jose, Santa Clara County, California. Margaret Elizabeth Creason (144.Edward5, 73.Sterling4, 15.Leroy3, 4.John2, 1.James1) b. 31 Oct 1910, California Birth Index: Margaret E Creason, Birth: 31 Oct 1910. Mother's Maiden Name: Simmons. Birth County: Siskiyou./Dunsmuir, Siskiyou County, California; d. 22 Nov 1986, Margaret Elizabeth Fratis./Placer County, California; bur. Nov 1986, Sylvan Cemetery/Citrus Heights, Sacramento County, California. Maxine Helen twin Creason (147.Chester5, 75.Enos4, 15.Leroy3, 4.John2, 1.James1) b. 06 Dec 1908, Sanger, Fresno County, California. 419. Jack Chester (Borkland) Stroud b. 29 Jan 1928, California Birth Index: Jack Chester Stroud, Birth: 29 Jan 1928, Mother's Maiden Name: Creason, Birth County: Fresno./Fresno County, California; d. 01 Jun 1994, SSDI/Piscataway, Middlesex County, New Jersey. Maudine Elizabeth twin Creason (147.Chester5, 75.Enos4, 15.Leroy3, 4.John2, 1.James1) b. 06 Dec 1908, California Birth Index: Maudine E Creason, Birth Date: 6 Dec 1908, Mother's Maiden Name: Maxwell, Birth County: Fresno./Sanger, Fresno County, California; d. 30 May 1972, California Death Index: Maudine E Moss, SSN: 554705366, Birth: 6 Dec 1908, California. Death: 30 May 1972, Los Angeles./Los Angeles County, California; bur. May 1972, Forest Lawn/Glendale, Los Angeles County, California. Bernice Helen Sloan (148.Myrtle5, 75.Enos4, 15.Leroy3, 4.John2, 1.James1) b. Apr 1896, California Birth Records: Bernice Helen Sloan. Birth: Apr 1896, Fresno, California. Father's Name: J E Sloan. Mother's name: Myrtle Creasen./Fresno County, California; d. 16 Apr 1981, Calif Death Index: Bernice Sloan Rhodehamel, SSN: 559011451, Birth Date: 13 Apr 1896, Birthplace: California, Death Date: 16 Apr 1981, Death Place: Santa Barbara, Mother's Maiden Name: Creason, Father's Surname: Sloan./Santa Barbara County, California. 423. Dale Rhodehamel b. Abt 1924, California. Annie Sloan (148.Myrtle5, 75.Enos4, 15.Leroy3, 4.John2, 1.James1) b. Abt 1905, California. Ardis Sloan (148.Myrtle5, 75.Enos4, 15.Leroy3, 4.John2, 1.James1) b. 14 Oct 1908, California; d. 31 Mar 1981, Calif Death Index: Ardis Sloan Bryant, SSN: 565680956, Birth Date: 14 Oct 1908, Birthplace: California, Death Date: 31 Mar 1981, Death Place: Santa Barbara, Mother's Maiden Name: Creason, Father's Surname: Sloan./Santa Barbara County, California. Myrtle A Sloan (148.Myrtle5, 75.Enos4, 15.Leroy3, 4.John2, 1.James1) b. 14 Oct 1908, California Birth Index: Myrtle A Sloan, Birth Date: 14 Oct 1908, Mother's Maiden Name: Creason, Birth County: Santa Barbara./Santa Barbara County, California. Goldie Parish (152.Ira5, 78.Rhoda4, 15.Leroy3, 4.John2, 1.James1) b. Nov 1899, Missouri. John Parish (152.Ira5, 78.Rhoda4, 15.Leroy3, 4.John2, 1.James1) b. Abt 1902, Stewartsville, Dekalb County, Missouri. Frederik "Fred" Parish (152.Ira5, 78.Rhoda4, 15.Leroy3, 4.John2, 1.James1) b. Abt 1904, Missouri. Theodore "Ted" Parish (152.Ira5, 78.Rhoda4, 15.Leroy3, 4.John2, 1.James1) b. Abt 1906, Missouri. Bessey Parish (152.Ira5, 78.Rhoda4, 15.Leroy3, 4.John2, 1.James1) b. Abt 1909, Missouri. Alice Parrish (152.Ira5, 78.Rhoda4, 15.Leroy3, 4.John2, 1.James1) b. Abt 1915, Missouri. Rhodabelle Parish (153.Chester5, 78.Rhoda4, 15.Leroy3, 4.John2, 1.James1) b. Abt 1905, Missouri. Alonzo E Roark (161.Boyd5, 79.Rachel4, 16.Hiram3, 4.John2, 1.James1) b. Jul 1890, Missouri. Rosco Lewis Roark (161.Boyd5, 79.Rachel4, 16.Hiram3, 4.John2, 1.James1) b. 21 Feb 1892, Missouri; d. 19 Jan 1977, Missouri. 426. Anna M Roark b. Abt 1918. 427. May Lois Roark b. Abt 1918, Missouri. 428. Grace I Roark b. Abt 1920, Missouri. 429. Finis W Roark b. Abt 1922. Oliver R Roark (161.Boyd5, 79.Rachel4, 16.Hiram3, 4.John2, 1.James1) b. May 1894, Missouri. James E Roark (161.Boyd5, 79.Rachel4, 16.Hiram3, 4.John2, 1.James1) b. Dec 1896, Missouri. Arthur M Roark (161.Boyd5, 79.Rachel4, 16.Hiram3, 4.John2, 1.James1) b. May 1899, Missouri. Jesse A Roark (161.Boyd5, 79.Rachel4, 16.Hiram3, 4.John2, 1.James1) b. 1903, Missouri. Sarah E Roark (161.Boyd5, 79.Rachel4, 16.Hiram3, 4.John2, 1.James1) b. 1905, Missouri. William V Roark (161.Boyd5, 79.Rachel4, 16.Hiram3, 4.John2, 1.James1) b. Abt 1909, Missouri. Stella Crane (167.Jeremiah5, 79.Rachel4, 16.Hiram3, 4.John2, 1.James1) b. Abt 1886, Missouri. Mary Crane (167.Jeremiah5, 79.Rachel4, 16.Hiram3, 4.John2, 1.James1) b. Abt 1890, Missouri. Minnie Crane (167.Jeremiah5, 79.Rachel4, 16.Hiram3, 4.John2, 1.James1) b. Abt 1892, Missouri. Annie Crane (167.Jeremiah5, 79.Rachel4, 16.Hiram3, 4.John2, 1.James1) b. Abt 1895, Missouri. Willie Crane (167.Jeremiah5, 79.Rachel4, 16.Hiram3, 4.John2, 1.James1) b. Abt 1898, Missouri. Homer Crane (167.Jeremiah5, 79.Rachel4, 16.Hiram3, 4.John2, 1.James1) b. Abt 1901, Missouri. Robert Lee "Bob" Duncan (171.Minnie5, 82.Mary4, 18.William3, 4.John2, 1.James1) b. 22 Jun 1896, Lexington, Lafayette County, Missouri; d. 01 Jul 1949, Lexington, Lafayette County, Missouri. 432. William Duncan b. Abt 1907, Missouri. Minnie B Duncan (171.Minnie5, 82.Mary4, 18.William3, 4.John2, 1.James1) b. 10 Aug 1900, Missouri; d. 19 May 1967. 438. George Brown b. Abt 1917, Missouri. 439. James Brown b. Abt 1922, Missouri. 440. Walter Brown b. Abt 1924, Missouri. Anna Irene Duncan (171.Minnie5, 82.Mary4, 18.William3, 4.John2, 1.James1) b. Abt 1902, Missouri. Gertrude "Gertie" M Duncan (171.Minnie5, 82.Mary4, 18.William3, 4.John2, 1.James1) b. 07 Oct 1904, Lexington, Lafayette County, Missouri; d. 12 Dec 1929, Lexington, Lafayette County, Missouri. William R "Bill" Duncan (171.Minnie5, 82.Mary4, 18.William3, 4.John2, 1.James1) b. 15 Jan 1907, Missouri; d. 15 Jun 2001. Addie Mae Duncan (171.Minnie5, 82.Mary4, 18.William3, 4.John2, 1.James1) b. 19 Aug 1909, Born Ida Touchstone Duncan. At age 16 she had her name legally changed to Addie Mae Duncan. Source: granddaughter Lissa./Lafayette County, Missouri; d. 15 Apr 1985. 443. Judith Ann Hill b. Missouri. 444. Marjorie Louise Hill b. Missouri. Mary L V Duncan (171.Minnie5, 82.Mary4, 18.William3, 4.John2, 1.James1) b. 03 Feb 1912, Lexington, Lafayette County, Missouri; d. 07 Jan 1913, Lexington, Lafayette County, Missouri. Dottie Reno Zero Duncan (171.Minnie5, 82.Mary4, 18.William3, 4.John2, 1.James1) b. 28 Jan 1915, Missouri; d. 1970, Orrick, Ray County, Missouri. Dollie Duncan (171.Minnie5, 82.Mary4, 18.William3, 4.John2, 1.James1) b. 17 Oct 1917, Lexington, Lafayette County, Missouri; d. 07 Aug 1918, Lexington, Lafayette County, Missouri. Opal Obanetta Creason (175.Benjamin5, 83.John4, 20.James3, 4.John2, 1.James1) b. 01 Aug 1906, Pettis County, Missouri; d. 22 Oct 1911, Saline County, Missouri. William Lawrence Creason (175.Benjamin5, 83.John4, 20.James3, 4.John2, 1.James1) b. 17 Jan 1911, Missouri; d. Nov 1985, Pueblo, Pueblo County, Colorado. Mary Isabelle Creason (175.Benjamin5, 83.John4, 20.James3, 4.John2, 1.James1) b. Abt 1914, Missouri. Irene I Creason (175.Benjamin5, 83.John4, 20.James3, 4.John2, 1.James1) b. Abt 1917, Missouri. Clara Frances Creason (175.Benjamin5, 83.John4, 20.James3, 4.John2, 1.James1) b. 17 Mar 1918, Sedalia, Pettis County, Missouri; d. 04 Mar 1968, Pueblo County, Colorado. 447. Lawrence Albert Burry b. 22 Aug 1936, Pueblo, Pueblo County, Colorado; d. 10 Aug 1974, Oklahoma City, Oklahoma County, Oklahoma. Maxwell P Creason (189.Clarence5, 88.James4, 24.John3, 5.James2, 1.James1) b. Abt 1906, Nebraska. Mervin F Creason (189.Clarence5, 88.James4, 24.John3, 5.James2, 1.James1) b. Abt 1907, Nebraska. Minta L Creason (189.Clarence5, 88.James4, 24.John3, 5.James2, 1.James1) b. Abt 1909, Nebraska. Jack T "Jay" Creason (189.Clarence5, 88.James4, 24.John3, 5.James2, 1.James1) b. 06 Feb 1910, Nebraska; d. 07 Dec 1984, Calif Death Index: Jay T Creason, SSN: 523102878, Birth: 6 Feb 1910, Nebraska. Death: 7 Dec 1984, Napa County. Mother's Maiden Name: Wileman./Napa County, California; bur. Dec 1984, St Helena Cemetery/St Helena, Napa County, California. 448. Noremma Louise Creason b. 13 Oct 1930, Fort Lupton, Weld County, Colorado; d. 23 Jan 1993, Washington County, Oregon. 449. Joyce Marie Creason b. 02 Apr 1933, Fort Lupton, Weld County, Colorado; d. 19 Mar 2005, Napa County, California. 450. Jack Theodore Creason b. 13 Feb 1935, Fort Lupton, Weld County, Colorado; d. 13 Sep 2000, Napa County, California. Clarence Dorsey Creason (189.Clarence5, 88.James4, 24.John3, 5.James2, 1.James1) b. 25 Dec 1912, Nebraska; d. 29 Oct 1955, California Death Index: Clarence Dorsey Creason, Birth: 25 Dec 1912, Colorado. Death: 29 Oct 1955, Napa County. Mother's Maiden Name: Wellman. Father's Surname: Creason./Napa County, California. Leland Robert Creason (189.Clarence5, 88.James4, 24.John3, 5.James2, 1.James1) b. 01 Jan 1917, Nebraska; d. 04 Mar 1987, Los Angeles County, California; bur. Mar 1987, El Dorado Public Cemetery/El Dorado, El Dorado County, California. 459. George Clarence Creason b. 21 Sep 1948, Denver County, Colorado; d. 15 Feb 2009, Palmdale, Los Angeles County, California. Carl Hubert Creason (189.Clarence5, 88.James4, 24.John3, 5.James2, 1.James1) b. 19 Jun 1919, Nebraska; d. 27 Dec 1953; bur. Dec 1953, Elmwood Cemetery/Fruita, Mesa County, Colorado. 460. Carl Hubert Jr Creason b. 02 Apr 1939, Colorado; d. 23 May 1993, Salt Lake City, Salt Lake County, Utah. Floyd G Creason (189.Clarence5, 88.James4, 24.John3, 5.James2, 1.James1) b. Abt 1922, Colorado. Fern C Karr (190.Rhoda5, 88.James4, 24.John3, 5.James2, 1.James1) b. 1902, Nebraska. Ralph O Karr (190.Rhoda5, 88.James4, 24.John3, 5.James2, 1.James1) b. Abt 1905, Nebraska. Gertrude A Karr (190.Rhoda5, 88.James4, 24.John3, 5.James2, 1.James1) b. 1908, Nebraska. Loren G Creason (191.Frederick5, 88.James4, 24.John3, 5.James2, 1.James1) b. Abt 1909, Nebraska. Floyd J Creason (191.Frederick5, 88.James4, 24.John3, 5.James2, 1.James1) b. Abt 1909, Nebraska. Lyle Creason (191.Frederick5, 88.James4, 24.John3, 5.James2, 1.James1) b. Abt 1910, Nebraska. Eileen Creason (191.Frederick5, 88.James4, 24.John3, 5.James2, 1.James1) b. Abt 1918, Nebraska. Mary Creason (192.Arthur5, 88.James4, 24.John3, 5.James2, 1.James1) b. Abt 1912, Nebraska. Marion Creason (192.Arthur5, 88.James4, 24.John3, 5.James2, 1.James1) b. Abt 1914, Nebraska. Doris Creason (192.Arthur5, 88.James4, 24.John3, 5.James2, 1.James1) b. Abt 1915, Nebraska. Gerald Grant Young (198.Lillie5, 89.John4, 24.John3, 5.James2, 1.James1) b. 30 Apr 1906, Hastings, Mills County, Iowa. Eileen Maureen Moody (209.Thomas6, 99.Thomas5, 49.George4, 11.John3, 2.Judith2, 1.James1) b. 26 Oct 1919, Pennsylvania; d. 23 Mar 1989, Hatboro, Montgomery county, Pennsylvania. Thomas Leroy Moody (209.Thomas6, 99.Thomas5, 49.George4, 11.John3, 2.Judith2, 1.James1) b. Abt 1920, Philadelphia, Pennsylvania; d. Abt 1935, Philadelphia, Pennsylvania. Hazel Creason (211.James6, 109.Robert5, 68.James4, 15.Leroy3, 4.John2, 1.James1) b. Abt 1908, Missouri. Dowell D Creason (214.Beverly6, 109.Robert5, 68.James4, 15.Leroy3, 4.John2, 1.James1) b. Abt 1913, Missouri. V Moline Creason (214.Beverly6, 109.Robert5, 68.James4, 15.Leroy3, 4.John2, 1.James1) b. Abt 1918, Missouri. Truman J Creason (214.Beverly6, 109.Robert5, 68.James4, 15.Leroy3, 4.John2, 1.James1) b. Abt 1921, Missouri. Doris V Creason (214.Beverly6, 109.Robert5, 68.James4, 15.Leroy3, 4.John2, 1.James1) b. Abt 1923, Missouri. Dorothy L Creason (224.Ola6, 111.Leroy5, 68.James4, 15.Leroy3, 4.John2, 1.James1) b. Abt 1916. Nolan M Creason (224.Ola6, 111.Leroy5, 68.James4, 15.Leroy3, 4.John2, 1.James1) b. 17 Sep 1916, Purdin, Linn County, Missouri; d. 16 Nov 1992, Carlsbad, Eddy County, New Mexico. Martha E Creason (224.Ola6, 111.Leroy5, 68.James4, 15.Leroy3, 4.John2, 1.James1) b. Abt 1918. Gerald Jerome Creason (228.Walter6, 112.Walter5, 68.James4, 15.Leroy3, 4.John2, 1.James1) b. 21 Jun 1920, Purdin, Linn County, Missouri; d. 26 Jan 1999, Saint George, Washington County, Utah; bur. Jan 1999, Larkin Sunset Gardens/Salt Lake City, Salt Lake County, Utah. 470. Larry David Creason b. 29 Jan 1944, Salt Lake City, Salt Lake County, Utah; d. 30 Jun 2005; bur. Jun 2005, Larkin Sunset Gardens/Salt Lake City, Salt Lake County, Utah. Walter Ray twin Creason (228.Walter6, 112.Walter5, 68.James4, 15.Leroy3, 4.John2, 1.James1) b. 11 Feb 1926, Linneus, Linn County, Missouri; d. 09 Jan 2009, Lexington, Lafayette County, Missouri. Mary Ramah twin Creason (228.Walter6, 112.Walter5, 68.James4, 15.Leroy3, 4.John2, 1.James1) b. 11 Feb 1926, Missouri; d. 19 Jan 2002, Richmond, Ray County, Missouri. Wayne Clifton Raley (238.Eunice6, 121.Hester5, 70.Collison4, 15.Leroy3, 4.John2, 1.James1) b. 12 Jun 1917, Mason, Lyon County, Nevada; d. 14 Apr 1988, Calif Death Index: Wayne Clifton Raley, Social Security #: 545281641, Birth: 12 Jun 1917, Nevada. Death: 14 Apr 1988, Yolo County. Mother's Maiden Name: Smith./West Sacramento, Yolo County, California. Elaine Raley (238.Eunice6, 121.Hester5, 70.Collison4, 15.Leroy3, 4.John2, 1.James1) b. 13 Feb 1920, California Birth Index: Elaine Raley, Birth Date: 13 Feb 1920, Mother's Maiden Name: Smith, Birth County: Kern./Kern County, California. Barbara Lee Creason (243.Leonard6, 122.Leonard5, 70.Collison4, 15.Leroy3, 4.John2, 1.James1) b. 23 Feb 1932, Los Angeles Time birth announcement on 2 Mar 1932/Los Angeles County, California; d. 17 Jul 1987, California Death Index: Barbara Lee Lyons./Los Angeles County, California. Robert Kenneth Creason (244.Kenneth6, 122.Leonard5, 70.Collison4, 15.Leroy3, 4.John2, 1.James1) b. 23 Oct 1931, Cook County Birth Index: Robert Creason, Birth Date: 23 Oct 1931, Birth Location: Cook County, IL, File Number: 6043616./Chicago, Cook County, Illinois; d. 12 Feb 1983, Calif Death Index: Robert Kenneth Creason, SSN: 559387766, Birth Date: 23 Oct 1931, Birthplace: Illinois, Death Date: 12 Feb 1983, Death Place: Los Angeles, Mother's Maiden Name: Lawrence./1624 S Meridian, Alhambra, Los Angeles County, California. 474. Gregory Alan Barton b. 24 Oct 1954, Los Angeles, Los Angeles County, California; d. 16 Mar 1993, Long Beach, Los Angeles County, California. 476. Susan Leigh Barton b. 06 Feb 1961, San Diego County, California; d. 20 Apr 1993, Los Angeles, Los Angeles County, California. Carole Ruth Creason (244.Kenneth6, 122.Leonard5, 70.Collison4, 15.Leroy3, 4.John2, 1.James1) b. 03 Nov 1941, San Gabriel, Los Angeles County, California; d. 24 Jul 2005, Lake Forest, Orange County, California. Frances M Nelson (246.Frank6, 124.Mary5, 70.Collison4, 15.Leroy3, 4.John2, 1.James1) b. 15 Dec 1905, California Birth Index: Frances N Nelson, Birth Date: 15 Dec 1905, Gender: Female, Mother's Maiden Name: Manning, Birth County: Fresno./Fresno County, California. Joseph J Nelson (246.Frank6, 124.Mary5, 70.Collison4, 15.Leroy3, 4.John2, 1.James1) b. 21 May 1909, California Birth Index: Joseph J Nelson, Birth Date: 21 May 1909, Mother's Maiden Name: Manning, Birth County: Fresno./Fresno County, California. Herbert Alva Rouch (250.Jessie6, 126.Albert5, 70.Collison4, 15.Leroy3, 4.John2, 1.James1) b. 16 Feb 1917, Fresno County, California; d. 06 Jul 1998, Fresno County, California. Melvin R Rouch (250.Jessie6, 126.Albert5, 70.Collison4, 15.Leroy3, 4.John2, 1.James1) b. 29 Dec 1918, Fresno County, California; d. May 1943, North Africa. Doris E Rouch (250.Jessie6, 126.Albert5, 70.Collison4, 15.Leroy3, 4.John2, 1.James1) b. Abt 1921, California. Elizabeth Louise "Betty" Creason (251.Lester6, 126.Albert5, 70.Collison4, 15.Leroy3, 4.John2, 1.James1) b. 05 Apr 1918, Kern County, California; d. 12 Oct 1989, Calif Death Index: Elisabeth Louise Hood, SSN#: 559099472, Birth: 5 Apr 1918, California. Death: 12 Oct 1989, Alameda County. Mother's Maiden Name: Becker, Father's Surname: Creason./Alameda County, California. Mildred Creason (251.Lester6, 126.Albert5, 70.Collison4, 15.Leroy3, 4.John2, 1.James1) b. Abt 1921. Living (251.Lester6, 126.Albert5, 70.Collison4, 15.Leroy3, 4.John2, 1.James1) b. 15 Feb 1923. Ben "Benny" A Phillips (254.Charlotte6, 126.Albert5, 70.Collison4, 15.Leroy3, 4.John2, 1.James1) b. 29 Jul 1926, California Birth Index: Benny Phillips Birth Date: 29 Jul 1926, Mother's Maiden Name: Creason, Birth County: San Mateo./San Mateo County, California; d. 21 Dec 1998, Felton, Santa Cruz County, California. Russell Thomas Phillips (254.Charlotte6, 126.Albert5, 70.Collison4, 15.Leroy3, 4.John2, 1.James1) b. 20 Apr 1928, California Birth Index: Russell Thomas Phillips, Birth Date: 20 Apr 1928, Mother's Maiden Name: Creason, Birth County: Kings./Kings County, California; d. 31 Dec 1987, Fresno County, California. Howard Dale Phillips (254.Charlotte6, 126.Albert5, 70.Collison4, 15.Leroy3, 4.John2, 1.James1) b. 07 Jan 1930, California Birth Index: Howard Dale Phillips, Birth Date: 7 Jan 1930, Mother's Maiden Name: Creason Birth County: Kings./Kings County, California; d. 10 Jul 2000, Kerman, Fresno County, California. Robert Lee "Bobby" Phillips (254.Charlotte6, 126.Albert5, 70.Collison4, 15.Leroy3, 4.John2, 1.James1) b. 12 Dec 1931, California Birth Index: Robert Lee Phillips, Birth Date: 12 Dec 1931, Mother's Maiden Name: Creason, Birth County: Fresno./Fresno County, California; d. 27 Sep 2004, Fresno, Fresno County, California. Homer Creason (255.Homer6, 127.George5, 72.Allen4, 15.Leroy3, 4.John2, 1.James1) b. 20 Oct 1923, Calif Birth Index: Homer Creason, 20 Oct 1923, Los Angeles County, Mother's Maiden Name: Muir/Los Angeles County, California. Sylvia Gale "Delbert" Creason (264.Sylvia6, 128.Robert5, 72.Allen4, 15.Leroy3, 4.John2, 1.James1) b. 09 Aug 1941, Glasgow, Howard County, Missouri; d. 16 Jul 1956, Death Certificate: Killed by electrical shock while working on wires./Missouri Township, Chariton County, Missouri. Fred Lynn (267.Jennie6, 128.Robert5, 72.Allen4, 15.Leroy3, 4.John2, 1.James1) b. 23 Apr 1915, Rushville, Schuyler County, Illinois. Dorothy La Jean Creason (279.Floyd6, 135.Robert5, 73.Sterling4, 15.Leroy3, 4.John2, 1.James1) b. 07 Apr 1921, California Birth Index: Dorothy L Creason, Birth Date: 7 Apr 1921, Mother's Maiden Name: Good, Birth County: Siskiyou./Siskiyou County, California. Lois Ann Wells (282.Alice6, 135.Robert5, 73.Sterling4, 15.Leroy3, 4.John2, 1.James1) b. 26 Apr 1922, Siskiyou County, California. Genevieve Edson (283.Lowell6, 136.Mary5, 73.Sterling4, 15.Leroy3, 4.John2, 1.James1) b. 12 Nov 1922. Marjorie Berniece Creason (286.Earl6, 140.James5, 73.Sterling4, 15.Leroy3, 4.John2, 1.James1) b. 11 Nov 1932, Calif Birth Index: Marjorie Berniece Creason, Birth Date: 11 Nov 1932, Mother's Maiden Name: Jones, Birth County: Siskiyou./Siskiyou County, California; d. 01 Jan 2002, Medford, Jackson County, Oregon. 507. Cheri Lynn Holt b. 08 Jul 1957, Calif Birth Index: Cheri L Holt, Birth Date: 8 Jul 1957, Mother's Maiden Name: Creason, Birth County: Shasta./Shasta County, California; d. 24 Apr 2006. Beverly Kaminsky (293.Muriel6, 143.Eleanor5, 73.Sterling4, 15.Leroy3, 4.John2, 1.James1) b. 22 Dec 1934; d. 24 Sep 1985. Jack Chester (Borkland) Stroud (296.Maxine6, 147.Chester5, 75.Enos4, 15.Leroy3, 4.John2, 1.James1) b. 29 Jan 1928, California Birth Index: Jack Chester Stroud, Birth: 29 Jan 1928, Mother's Maiden Name: Creason, Birth County: Fresno./Fresno County, California; d. 01 Jun 1994, SSDI/Piscataway, Middlesex County, New Jersey. Dale Rhodehamel (298.Bernice6, 148.Myrtle5, 75.Enos4, 15.Leroy3, 4.John2, 1.James1) b. Abt 1924, California. Anna M Roark (310.Rosco6, 161.Boyd5, 79.Rachel4, 16.Hiram3, 4.John2, 1.James1) b. Abt 1918. May Lois Roark (310.Rosco6, 161.Boyd5, 79.Rachel4, 16.Hiram3, 4.John2, 1.James1) b. Abt 1918, Missouri. Grace I Roark (310.Rosco6, 161.Boyd5, 79.Rachel4, 16.Hiram3, 4.John2, 1.James1) b. Abt 1920, Missouri. Finis W Roark (310.Rosco6, 161.Boyd5, 79.Rachel4, 16.Hiram3, 4.John2, 1.James1) b. Abt 1922. William Duncan (323.Robert6, 171.Minnie5, 82.Mary4, 18.William3, 4.John2, 1.James1) b. Abt 1907, Missouri. George Brown (324.Minnie6, 171.Minnie5, 82.Mary4, 18.William3, 4.John2, 1.James1) b. Abt 1917, Missouri. James Brown (324.Minnie6, 171.Minnie5, 82.Mary4, 18.William3, 4.John2, 1.James1) b. Abt 1922, Missouri. Walter Brown (324.Minnie6, 171.Minnie5, 82.Mary4, 18.William3, 4.John2, 1.James1) b. Abt 1924, Missouri. Judith Ann Hill (328.Addie6, 171.Minnie5, 82.Mary4, 18.William3, 4.John2, 1.James1) b. Missouri. Marjorie Louise Hill (328.Addie6, 171.Minnie5, 82.Mary4, 18.William3, 4.John2, 1.James1) b. Missouri. Lawrence Albert Burry (336.Clara6, 175.Benjamin5, 83.John4, 20.James3, 4.John2, 1.James1) b. 22 Aug 1936, Pueblo, Pueblo County, Colorado; d. 10 Aug 1974, Oklahoma City, Oklahoma County, Oklahoma. Noremma Louise Creason (340.Jack6, 189.Clarence5, 88.James4, 24.John3, 5.James2, 1.James1) b. 13 Oct 1930, Fort Lupton, Weld County, Colorado; d. 23 Jan 1993, Washington County, Oregon. Joyce Marie Creason (340.Jack6, 189.Clarence5, 88.James4, 24.John3, 5.James2, 1.James1) b. 02 Apr 1933, Fort Lupton, Weld County, Colorado; d. 19 Mar 2005, Napa County, California. Jack Theodore Creason (340.Jack6, 189.Clarence5, 88.James4, 24.John3, 5.James2, 1.James1) b. 13 Feb 1935, Fort Lupton, Weld County, Colorado; d. 13 Sep 2000, Napa County, California. George Clarence Creason (342.Leland6, 189.Clarence5, 88.James4, 24.John3, 5.James2, 1.James1) b. 21 Sep 1948, Denver County, Colorado; d. 15 Feb 2009, Palmdale, Los Angeles County, California. Carl Hubert Jr Creason (343.Carl6, 189.Clarence5, 88.James4, 24.John3, 5.James2, 1.James1) b. 02 Apr 1939, Colorado; d. 23 May 1993, Salt Lake City, Salt Lake County, Utah. Larry David Creason (369.Gerald7, 228.Walter6, 112.Walter5, 68.James4, 15.Leroy3, 4.John2, 1.James1) b. 29 Jan 1944, Salt Lake City, Salt Lake County, Utah; d. 30 Jun 2005; bur. Jun 2005, Larkin Sunset Gardens/Salt Lake City, Salt Lake County, Utah. Gregory Alan Barton (376.Living7, 244.Kenneth6, 122.Leonard5, 70.Collison4, 15.Leroy3, 4.John2, 1.James1) b. 24 Oct 1954, Los Angeles, Los Angeles County, California; d. 16 Mar 1993, Long Beach, Los Angeles County, California. Susan Leigh Barton (376.Living7, 244.Kenneth6, 122.Leonard5, 70.Collison4, 15.Leroy3, 4.John2, 1.James1) b. 06 Feb 1961, San Diego County, California; d. 20 Apr 1993, Los Angeles, Los Angeles County, California. Cheri Lynn Holt (409.Marjorie7, 286.Earl6, 140.James5, 73.Sterling4, 15.Leroy3, 4.John2, 1.James1) b. 08 Jul 1957, Calif Birth Index: Cheri L Holt, Birth Date: 8 Jul 1957, Mother's Maiden Name: Creason, Birth County: Shasta./Shasta County, California; d. 24 Apr 2006.